Text for this article comes from three Wikipedia articles: Io (moon), Volcanism on Io, and Exploration of Io. Text made available via the Creative Commons Attribution-ShareAlike License. Image captions were trimmed due to limitations of the Blogger software. See the original articles for references. Io (pronounced /ˈaɪ.oʊ/, or as Greek Ἰώ) is the innermost of the four Galilean moons of the planet Jupiter and, with a diameter of 3,642 kilometres (2,263 mi), the fourth-largest moon in the Solar System. It was named after Io, a priestess of Hera who became one of the lovers of Zeus. With over 400 active volcanoes, Io is the most geologically active object in the Solar System. This extreme geologic activity is the result of tidal heating from friction generated within Io's interior as it is pulled between Jupiter and the other Galilean satellites—Europa, Ganymede and Callisto. Several volcanoes produce plumes of sulfur and sulfur dioxide that climb as high as 500 km (310 mi) above the surface. Io's surface is also dotted with more than 100 mountains that have been uplifted by extensive compression at the base of the moon's silicate crust. Some of these peaks are taller than Earth's Mount Everest. Unlike most satellites in the outer Solar System, which are mostly composed of water ice, Io is primarily composed of silicate rock surrounding a molten iron or iron sulfide core. Most of Io's surface is characterized by extensive plains coated with sulfur and sulfur dioxide frost. Io's volcanism is responsible for many of that satellite's unique features. Its volcanic plumes and lava flows produce large surface changes and paint the surface in various shades of yellow, red, white, black, and green, largely due to allotropes and compounds of sulfur. Numerous extensive lava flows, several longer than 500 kilometres (311 mi) in length, also mark the surface. 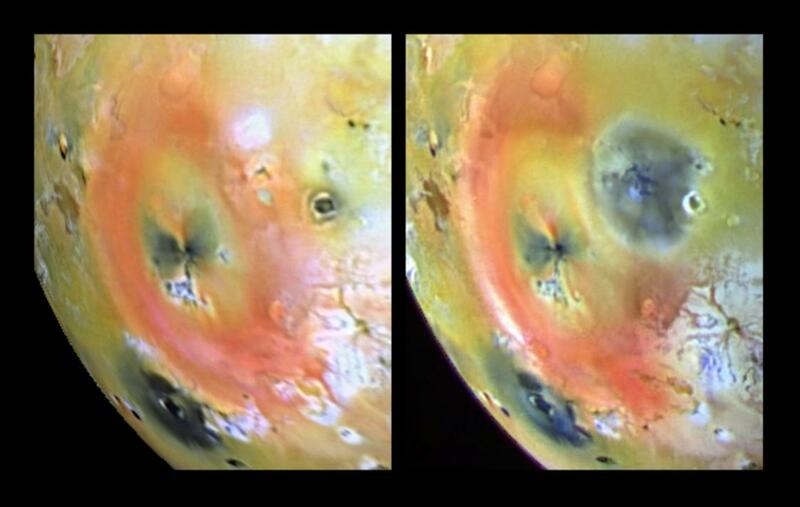 These volcanic processes have given rise to a comparison of the visual appearance of Io's surface to a pizza. The materials produced by this volcanism provide material for Io's thin, patchy atmosphere and Jupiter's extensive magnetosphere. Io played a significant role in the development of astronomy in the 17th and 18th centuries. It was discovered in 1610 by Galileo Galilei, along with the other Galilean satellites. 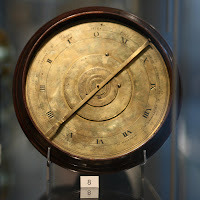 This discovery furthered the adoption of the Copernican model of the Solar System, the development of Kepler's laws of motion, and the first measurement of the speed of light. From Earth, Io remained nothing more than a point of light until the late 19th and early 20th centuries, when it became possible to resolve its large-scale surface features, such as the dark red polar and bright equatorial regions. In 1979, the two Voyager spacecraft revealed Io to be a geologically active world, with numerous volcanic features, large mountains, and a young surface with no obvious impact craters. The Galileo spacecraft performed several close flybys in the 1990s and early 2000s, obtaining data about Io's interior structure and surface composition. These spacecraft also revealed the relationship between the satellite and Jupiter's magnetosphere and the existence of a belt of radiation centered on Io's orbit. Io receives about 3,600 rem of radiation per day. Further observations have been made by Cassini–Huygens in 2000 and New Horizons in 2007, as well as from Earth-based telescopes and the Hubble Space Telescope as their technology has advanced. While Simon Marius is not credited with the sole discovery of the Galilean satellites, his names for the moons have stuck. In his 1614 publication Mundus Iovialis anno M.DC.IX Detectus Ope Perspicilli Belgici, he proposed several possible names for the innermost of the large moons of Jupiter, including The Mercury of Jupiter or The First of the "Jovian Planets". Based on a suggestion from Johannes Kepler in October 1613, he also generated a naming scheme so that each moon was given its own name based on the lovers of the Greek mythological Zeus or his Roman equivalent, Jupiter. In this case, he named the innermost large moon of Jupiter after the Greek mythological figure Io. The most common adjectival form of the name is Ionian. Marius' names fell out of favor, and were not revived in common use until the mid-20th century. 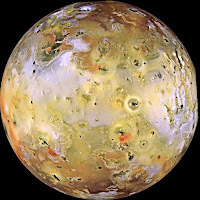 In much of the earlier astronomical literature, Io is simply referred to by its Roman numeral designation (a system introduced by Galileo) as "Jupiter I", or simply as "the first satellite of Jupiter". 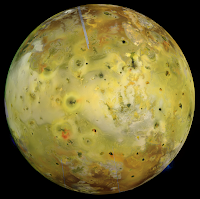 Features on Io are named after characters and places from the Io myth, as well as deities of fire, volcanoes, the Sun, and thunder from various myths, and characters and places from Dante's Inferno, names appropriate to the volcanic nature of the surface. Since the surface was first seen up close by Voyager 1 the International Astronomical Union has approved 225 names for Io's volcanoes, mountains, plateaus, and large albedo features. The approved feature categories used for Io for different types of volcanic features include patera (volcanic depression), fluctus (lava flow), vallis (lava channel), and active eruptive center (location where plume activity was the first sign of volcanic activity at a particular volcano). Named mountains, plateaus, layered terrain, and shield volcanoes use the terms mons, mensa, planum, tholus, respectively. Named, bright albedo regions use the term regio. Examples of named features include Prometheus, Pan Mensa, Tvashtar Paterae, and Tsũi Goab Fluctus. The exploration of Io, Jupiter's third-largest moon, began with its discovery in 1610 and continues today with Earth-based observations and visits by spacecraft to the Jupiter system. Italian astronomer Galileo Galilei was the first to record an observation of Io on January 8, 1610, though Simon Marius may have also observed Io at around the same time. During the 17th century, observations of Io and the other Galilean satellites helped with the measurement of longitude by map makers and surveyors, with validation of Kepler's Third Law of planetary motion, and with measurement of the speed of light. Based on ephemerides produced by astronomer Giovanni Cassini and others, Pierre-Simon Laplace created a mathematical theory to explain the resonant orbits of three of Jupiter's moons, Io, Europa, and Ganymede. This resonance was later found to have a profound effect on the geologies of these moons. Improved telescope technology in the late 19th and 20th centuries allowed astronomers to resolve (that is, see) large-scale surface features on Io as well as to estimate its diameter, mass, and surface composition. 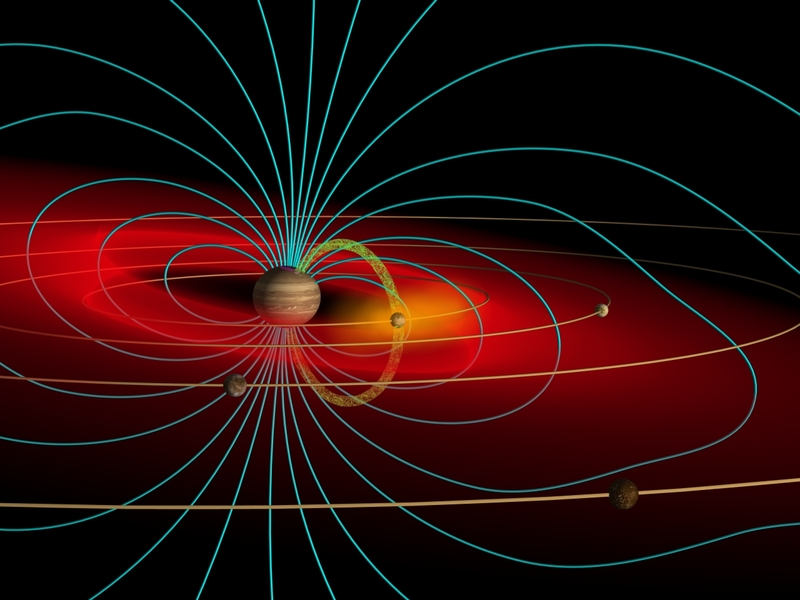 In the 1960s the moon's previously unknown effect on Jupiter's magnetic field was discovered. The advent of unmanned spaceflight in the 1950s and 1960s provided an opportunity to observe Io up-close. The flybys of the two Pioneer probes, Pioneer 10 and 11 in 1973 and 1974, provided the first accurate measurement of Io's mass and size. Data from the Pioneers also revealed an intense belt of radiation near Io and suggested the presence of an Ionian atmosphere. In 1979, the two Voyager spacecraft flew through the Jupiter system. Voyager 1, during its encounter in March 1979, observed active volcanism on Io for the first time and mapped its surface in great detail, particularly the side that faces Jupiter. 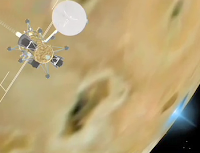 The Voyagers observed the Io plasma torus and Io's sulfur dioxide (SO2) atmosphere for the first time. NASA launched the Galileo spacecraft in 1989, which entered Jupiter's orbit in December 1995. Galileo allowed detailed study of both the planet and its satellites, including six flybys of Io between late 1999 and early 2002 that provided high-resolution images and spectra of Io's surface, confirming the presence of high-temperature silicate volcanism on Io. Distant observations by Galileo allowed planetary scientists to study changes on the surface that resulted from the moon's active volcanism. Following Galileo and a distant encounter by the Pluto-bound New Horizons spacecraft in 2007, NASA and the European Space Agency (ESA) made plans to return to the Jupiter system and Io. In 2009, NASA approved a plan to send an orbiter to Europa called the Jupiter Europa Orbiter as part of a joint program with ESA called the Europa/Jupiter System Mission. The ESA component of the project, the Jupiter Ganymede Orbiter, is on their shortlist of large-scale missions to be launched in the next decade, with final approval expected in 2011. While these missions will perform Io science as ancillary to their primary missions, the proposed NASA Discovery mission Io Volcano Observer, which still needs to go through a competitive process to be approved, would explore Io as its primary mission. In the meantime, Io continues to be observed by the Hubble Space Telescope as well as by Earth-based astronomers using improved telescopes such as Keck and the European Southern Observatory, which use new technologies such as adaptive optics. The first recorded observation of Io was made by Tuscan astronomer Galileo Galilei on January 7, 1610 using a 20x-power, refracting telescope at the University of Padua in the Republic of Venice. The discovery was made possible by the invention of the telescope in The Netherlands a little more than a year earlier and by Galileo's innovations to improve the magnification of the new instrument. During his observation of Jupiter on the evening of January 7, Galileo spotted two stars to the east of Jupiter and another one to the west. Jupiter and these three stars appeared to be in a line parallel to the ecliptic. The star furthest to the east from Jupiter turned out to be Callisto while the star to the west of Jupiter was Ganymede. The third star, the closest one to the east of Jupiter, was a combination of the light from Io and Europa as Galileo's telescope, while having a high magnification for a telescope from his time, was too low-powered to separate the two moons into distinct points of light. 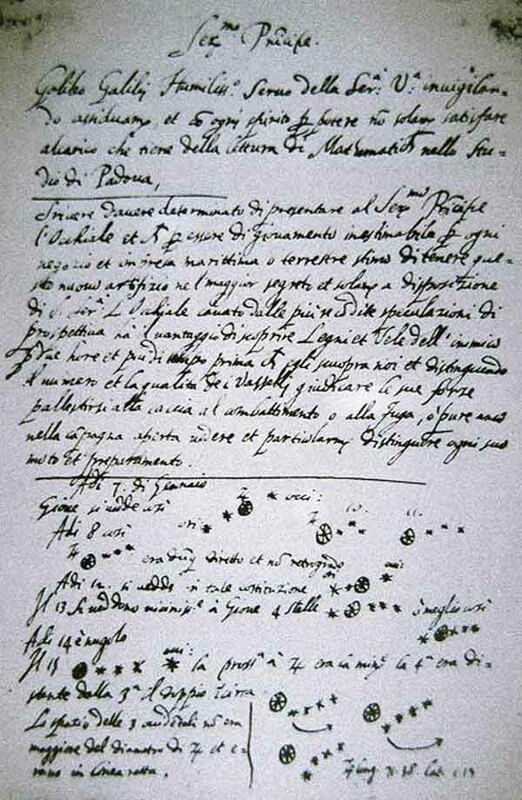 Galileo observed Jupiter the next evening, January 8, 1610, this time seeing three stars to the west of Jupiter, suggesting that Jupiter had moved to the west of the three stars. During this observation, the three stars in a line to the west of Jupiter were (from east to west): Io, Europa, and Ganymede. This was the first time that Io and Europa were observed and recorded as distinct points of light so this date, January 8, 1610 is used as the discovery date for the two moons by the International Astronomical Union. Galileo continued to observe the Jupiter system for the next month and a half. On January 13, Galileo observed all four of the what would later be known as the Galilean moons of Jupiter for the first time in a single observation, though he had observed all four at various times in the preceding days. On January 15, he observed the motions of three of these satellites, including Io, and came to the conclusions that these objects were not background stars, but were in fact, "three stars in the heavens moving about Jupiter, as Venus and Mercury round the Sun." These were the first moons of a planet other than the Earth to be discovered. The discoveries of Io and the other Galilean satellites of Jupiter were published in Galileo's Sidereus Nuncius in March 1610. While the Jovian moons he discovered would later be known as the Galilean satellites, after himself, he proposed the name Medicea Sidera (Medicean Stars) after his new patrons, the de'Medici family of his native Florence. Initially, he proposed the name Cosmica Sidera (Cosmic Stars), after the head of the family, Cosimo II de'Medici, however both Cosimo and Galileo decided on the change to honor the family as a whole. However, Galileo did not name each of the four moons individually beyond a numerical system in which Io was referred to as Jupiter I. By December 1610, thanks to the publication of Sidereus Nuncius the news of Galileo's discovery had spread throughout Europe. With high-powered telescopes like Galileo's becoming more available, other astronomers, such as Thomas Harriot in England, Nicolas-Claude Fabri de Peiresc and Joseph Gaultier de la Vallette in France, Johannes Kepler in Bavaria, and Christopher Clavius in Rome, were able to observe Io and the other Medicean Stars during fall and winter of 1610–1611. In his book Mundus Iovialis ("The World of Jupiter"), published in 1614, Simon Marius, the court astronomer to the Margraves of Brandenburg-Ansbach, claimed to have discovered Io and the other moons of Jupiter in 1609, one week before Galileo's discovery. According to Marius, he began observing the Jupiter system in late November 1609. He continued to observe the moons of Jupiter through December 1609, but did not record his observations until December 29, 1609 when he came to the conclusion "that these stars moved round Jupiter, just as the five solar planets, Mercury, Venus, Mars, Jupiter, and Saturn revolve round the sun." However, Marius' observations were dated based on the Julian calendar, which was 10 days behind the Gregorian calendar used by Galileo. 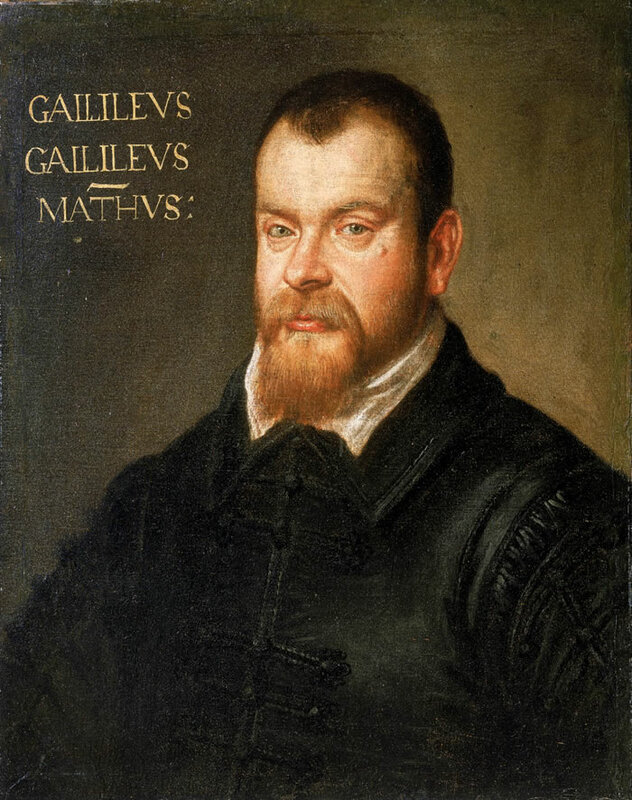 So Marius' first recorded observation from December 29, 1609 equates to Galileo's second observation of the Jupiter system on January 8, 1610. Galileo doubted this claim and dismissed the work of Marius as plagiarism. Given that Galileo published his work before Marius and that his first recorded observation came one day before Marius', Galileo is credited with the discovery. Despite this, it is one of Marius' naming schemes for the moons of Jupiter that is regularly used today. Based on a suggestion from Johannes Kepler in October 1613, he proposed that each moon was given its own name based on the lovers of the Greek mythological Zeus or his Roman equivalent, Jupiter. He named the innermost large moon of Jupiter after the Greek mythological figure Io. For the next two and a half centuries, because of the satellite's small size and distance, Io remained a featureless, 5th-magnitude point of light in astronomers' telescopes. So, the determination of its orbital period, along with those of the other Galilean satellites, was an early focus for astronomers. By June 1611, Galileo himself had determined that Io's orbital period was 42.5 hours long, only 2.5 minutes longer than the modern estimate. Simon Marius' estimate was only one minute longer in the data published in Mundus Iovalis. The orbital periods generated for Io and the other Jovian satellites provided an additional validation for Kepler's Third Law of planetary motion. From these estimates of the orbital periods of Io and the other Galilean moons, astronomers hoped to generate ephemeris tables predicting the positions of each moon with respect to Jupiter, as well as when each moon would transit the face of Jupiter or be eclipsed by it. One benefit of such predictions, particularly those of satellite eclipses by Jupiter since they were subject to less observer error, would be determining an observer's longitude on Earth with respect to the prime meridian. By observing an eclipse of a Jovian satellite, an observer could determine the current time at the prime meridian by looking up the eclipse in an ephemeris table. Io was particularly useful for this purpose since its shorter orbital period and closer distance to Jupiter made eclipses more frequent and less affected by Jupiter's axial tilt. Knowing the time at the prime meridian and the local time, the observer's longitude could then be calculated. Galileo attempted to produce a table predicting the positions of the Jovian satellites and eclipse timings after he negotiated first with Spain and then with The Netherlands to create a system for measuring longitude at sea using eclipse timings. However, he was never able to generate accurate predictions far enough ahead in time to be useful so he never published his tables. This left the tables published by Simon Marius in Mundus Iovialis and Giovanni Battista Hodierna in 1654 as the most accurate ephemeris tables available, even though they too were unable to predict the moons' positions with sufficient accuracy. Giovanni Cassini published a much more accurate ephemeris table in 1668 using his observations from the previous 16 years. Using this table, Cassini generated a more accurate map of France by observing eclipses of the Jovian satellites at various locations across the country. This showed that previous maps had depicted some shorelines as extending farther than they really did, which caused the apparent area of France to shrink, and led King Louis XIV to comment that "he was losing more territory to his astronomers than to his enemies." Eclipse timings of the Jovian moons would continue to be used to determine longitude for another hundred years for tasks such as surveying the Mason-Dixon Line and geodesy measurements. Efforts were made to utilize this method for marine navigation, but it proved to be impossible to make the necessary observations with sufficient accuracy from the moving deck of a ship; it would not be until the invention of the marine chronometer in the mid-18th century that determining longitude at sea became practical. 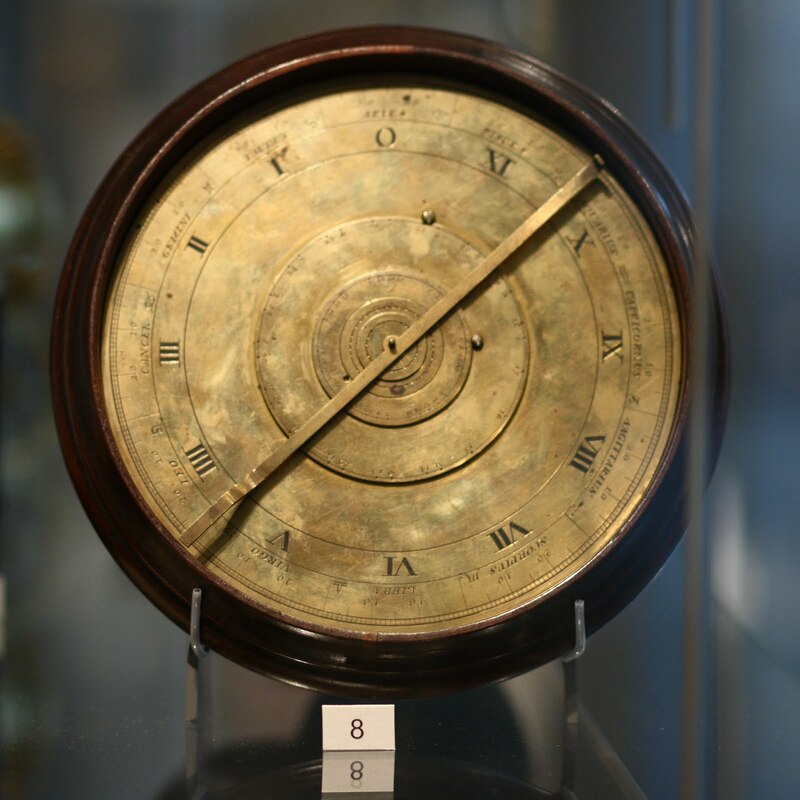 During the 17th and 18th centuries astronomers used the ephemeris tables generated by Cassini to better understand the nature of the Jovian system and light. In 1675, Danish astronomer Ole Rømer found that observed eclipse times for Io were earlier than predicted when Jupiter was closest to Earth at opposition and later than predicted when Jupiter was furthest from Earth at conjunction. He determined that these discrepancies were due to light having a finite speed. Ole Rømer never published his findings, but he sent along his measurements to Dutch mathematician Christiaan Huygens. Huygens used Rømer's estimate of 22 minutes for light to traverse the diameter of the Earth's orbit to calculate that light traveled 220,000 km/s, 26% less than the modern value. Using Ole Rømer's data and a modern value for the astronomical unit, his measurement that light takes 16.44 minutes to travel the distance of the diameter of Earth's orbit was only 2% greater than the modern-day value, though this was not calculated at the time. In 1809, again making use of observations of Io, but this time with the benefit of more than a century of increasingly precise observations, the French astronomer Jean Baptiste Joseph Delambre reported the time for light to travel from the Sun to the Earth as 8 minutes and 12 seconds. Depending on the value assumed for the astronomical unit, this yields the speed of light as just a little more than 300,000 kilometers (186,000 mi) per second. In 1788, Pierre-Simon Laplace used Cassini's ephemerides and those produced by other astronomers in the preceding century to create a mathematical theory explaining the resonant orbits of Io, Europa, and Ganymede. The ratios of the orbital periods of the inner three Galilean moons are simple integers: Io orbits Jupiter twice every time Europa orbits once, and four times for each revolution by Ganymede; this is sometimes referred to as the Laplace resonance. Laplace also found that the slight difference between these exact ratios and reality was due to their mean motions accounting for the precession of the periapse for Io and Europa. This resonance was later found to have a profound effect on the geologies of the three moons. Improved telescopes and mathematical techniques allowed astronomers in the 19th and 20th centuries to estimate many of Io's physical properties, such as its mass, diameter, and albedo, as well as to resolve large-scale surface features on it. In his 1805 book Celestial Mechanics, in addition to laying out his mathematical argument for the resonant orbits of Io, Europa, and Ganymede, Laplace was able to use perturbations on the orbit of Io by Europa and Ganymede to provide the first estimate of Io's mass, 1.73 × 10−5 of the mass of Jupiter, which was one-quarter of the modern value. Through the mid-20th century, additional mass estimates using this technique would be performed by Marie-Charles Damoiseau, John Couch Adams, Ralph Allen Sampson, and Willem de Sitter, all of which were less than the modern value with the closest being Sampson's 1921 estimate of 4.5 × 10−5 of the mass of Jupiter, which was 4% less than the currently accepted mass. Io's diameter was estimated using micrometer measurements and occultations of background stars by Io. Edward E. Barnard used a micrometer at the Lick Observatory in 1897 to estimate a diameter of 3,950 km (2,450 mi), 8.5% larger than the accepted modern value, while Albert Michelson, also using the Lick telescope, came up with a better estimate of 3,844 km (2,389 mi). The best pre-spacecraft estimate of Io's diameter and shape came from the observations of an occultation of the star Beta Scorpii C on May 14, 1971, where a diameter of 3,636 km (2,259 mi) was found, slightly less the accepted modern value. These measurements allowed astronomers to estimate Io's density, given as 2.88 g/cm3 following the Beta Scorpii occultation. While this is 20% less than the currently accepted value, it was enough for astronomers to note the differences between the densities of the inner two Galilean satellites (Io and Europa) versus the outer two Galilean satellites (Ganymede and Callisto). The densities of Io and Europa suggested that they were composed primarily of rock while Ganymede and Callisto contained more ices. Beginning in the 1890s, larger telescopes allowed astronomers to directly observe large scale features on the surfaces of the Galilean satellites including Io. In 1892, William Pickering measured Io's shape using a micrometer, and similar to his measurement of Ganymede, found it to have an elliptical outline aligned with the direction of its orbital motion. Other astronomers between 1850 and 1895 noted Io's elliptical shape. Edward Barnard observed Io while it transited across the face of Jupiter, finding the poles of Io to be dark compared to a brighter equatorial band. Initially, Barnard concluded that Io was in fact a binary of two dark bodies, but observations of additional transits against Jovian cloud bands of different brightness and the round shape of Io's shadow on the Jovian cloud tops caused him to change his interpretation. The egg-shape of Io reported by Pickering was the result of measuring only the bright equatorial band of Io, and mistaking the dark poles for background space. Later telescopic observations confirmed Io's distinct reddish-brown polar regions and yellow-white equatorial band. Observations of variations in the brightness of Io as it rotated, made by Joel Stebbins in the 1920s, showed that Io's day was the same length as its orbital period around Jupiter, thus proving that one side always faced Jupiter just as the Moon's near-side always faces the Earth. Stebbins also noted Io's dramatic orange coloration, which was unique among the Galilean satellites. Audouin Dollfus used observations of Io in the early 1960s at the Pic du Midi Observatory to create crude maps of the satellite that showed a patchwork of bright and dark spots across the Ionian surface, as well as a bright equatorial belt and dark polar regions. 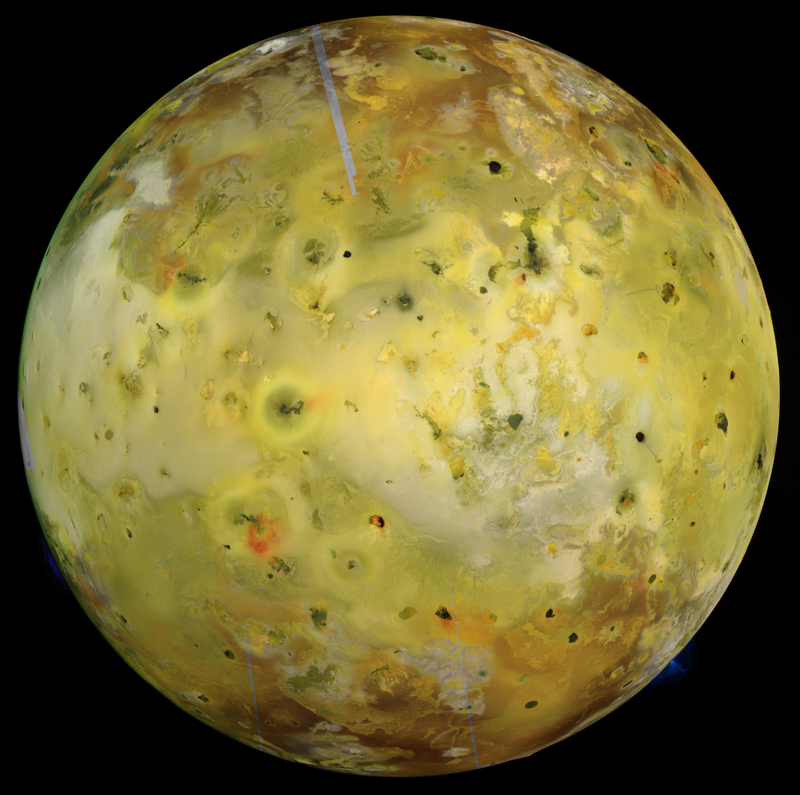 Telescopic observations in the mid-20th century began to hint at Io's unusual nature. 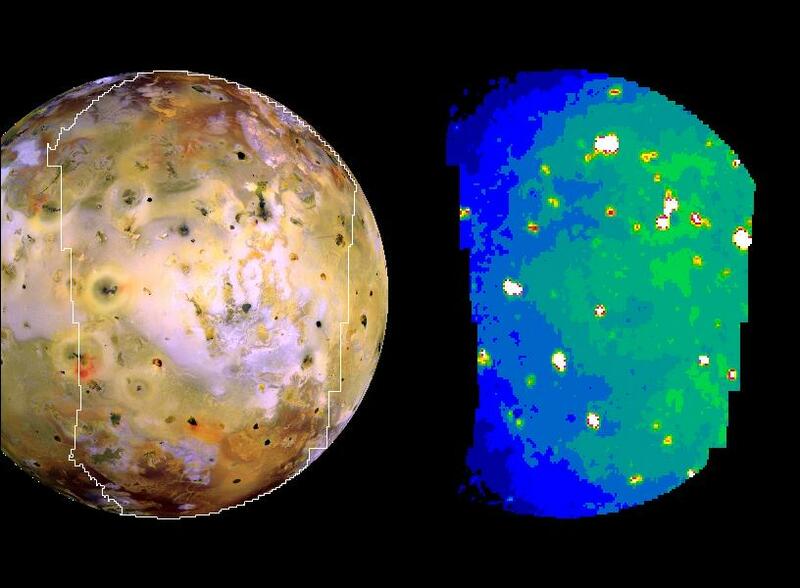 The near-infrared spectroscopy suggested that Io's surface was devoid of water ice. The lack of water on Io was consistent with the moon's estimated density, although, abundant water ice was found on the surface of Europa, a moon thought to have the same density as Io. Lee concluded that the spectrum was consistent with the presence of sulfur compounds. Binder and Cruikshank (1964) reported that Io's surface was brighter coming out of Jupiter's shadow than when it entered it. The authors suggested that this anomalous brightening after an eclipse was the result of an atmosphere partially freezing out onto the surface during the eclipse darkness with the frost slowly sublimating away after the eclipse. Attempts to confirm this result met with mixed results: some researchers reported a post-eclipse brightening, while others did not. Later modeling of Io's atmosphere would show that such brightening would only be possible if Io's SO2 atmosphere froze out enough to produce a layer several millimeters thick, which seemed unlikely. Radio telescopic observations revealed Io's influence on the Jovian magnetosphere, as demonstrated by decametric wavelength bursts tied to the orbital period of Io (Io-DAM), suggesting an electrodynamic coupling between the two worlds. In the late 1960s, a concept known as the Planetary Grand Tour was developed in the United States by NASA and the Jet Propulsion Laboratory (JPL). It would allow a single spacecraft to travel past the asteroid belt and onto each of the outer planets, including Jupiter, if the mission was launched in 1976 or 1977. However, there was uncertainty over whether a spacecraft could survive passage through the asteroid belt, where micrometeoroids could cause it physical damage, or the intense Jovian magnetosphere, where charged particles could harm sensitive electronics. To resolve these questions before sending the more ambitious Voyager missions, NASA and the Ames Research Center launched a pair of twin probes, Pioneer 10 and Pioneer 11 on March 3, 1972 and April 6, 1973, respectively, on the first unmanned mission to the outer solar system. Pioneer 10 became the first spacecraft to reach the Jupiter system on December 3, 1973. It passed within 357,000 km (222,000 mi) of Io. During Pioneer 10's fly-by of Io, the spacecraft performed a radio occultation experiment by transmitting an S-band signal as Io passed between it and Earth. A slight attenuation of the signal before and after the occultation showed that Io had an ionosphere, suggesting the presence of a thin atmosphere with a pressure of 1.0 × 10−7 bar, though the composition was not determined. This was the second atmosphere to be discovered around a moon of an outer planet, after Saturn's moon Titan. Close-up images using Pioneer's Imaging Photopolarimeter were planned as well, but were lost because of the high-radiation environment. Pioneer 10 also discovered a hydrogen ion torus at the orbit of Io. Pioneer 11 encountered the Jupiter system nearly one year later on December 2, 1974, approaching to within 314,000 km (195,000 mi) of Io. Pioneer 11 provided the first spacecraft image of Io, a 357 km (222 mi) per pixel frame (D7) over Io's north polar region taken from a distance of 470,000 km (290,000 mi). This low-resolution image revealed dark patches on Io's surface akin to those hinted at in maps by Audouin Dollfus. Observations by both Pioneers revealed that Jupiter and Io were connected by an electrical conduit known as the Io flux tube, which consists of magnetic field lines trending from the Jupiter's poles to the satellite. Pioneer 11's closer encounter with Jupiter allowed the spacecraft to discover Jupiter's intense radiation belts similar to Earth's Van Allen Belts. One of the peaks in charged particle flux was found near the orbit of Io. Radio tracking during the encounters of both Pioneers with Io provided an improved estimate of the moon's mass. This was accomplished by analyzing slight changes in trajectory of the two probes due to the influence of Io's gravity and calculating the mass necessary to produce the deviations. When this estimate was combined with the best available information on Io's size, Io was found to have the highest density of the four Galilean satellites and that the densities of the four Galilean satellites trended downward with increasing distance from Jupiter. The high density of Io (3.5 g/cm3) indicated that it was composed primarily of silicate rock rather than water ice. Following the Pioneer encounters and in the lead up to the Voyager fly-bys in 1979, interest in Io and the other Galilean satellites grew, with the planetary science and astronomy communities going so far as to convene a week of dedicated Io observations by radio, visible, and infrared astronomers in November 1974 known as "Io Week." New observations of Io from Earth and by the Pioneers during the mid-1970s caused a paradigm shift in thinking about its surface chemistry and formation. The trend in the densities of the four Galilean satellites found by Pioneer 10 suggested that the satellites formed as part of a collapsing nebula, like a miniature version of what took place in the solar system as a whole. The initial hot Jupiter prevented the condensation of water at the orbits of Io and Europa, leading those bodies to have higher densities than the outer two moons. Spectroscopic measurements of the light reflected from Io and its surrounding space were made with increasing spectral resolution during the 1970s, providing new insights into its surface composition. Other observations suggested that Io had a surface dominated by evaporites composed of sodium salts and sulfur. This was consistent with Io lacking water ice either on its surface or in its interior, in contrast with the other Galilean satellites. An absorption band near 560 nm was identified with the radiation-damaged form of the mineral halite. It was thought that deposits of the mineral on Io's surface were the origin of a cloud of sodium atoms surrounding Io, created through energetic-particle sputtering. Measurements of Io's thermal radiation in the mid-infrared spectrum in the 1970s led to conflicting results that were not explained accurately until after the discovery of the active volcanism by Voyager 1 in 1979. An anomalously high thermal flux, compared to the other Galilean satellites, was observed at an infrared wavelength of 10 μm while Io was in Jupiter's shadow. At the time, this heat flux was attributed to the surface having a much higher thermal inertia than Europa and Ganymede. These results were considerably different from measurements taken at wavelengths of 20 μm which suggested that Io had similar surface properties to the other Galilean satellites. 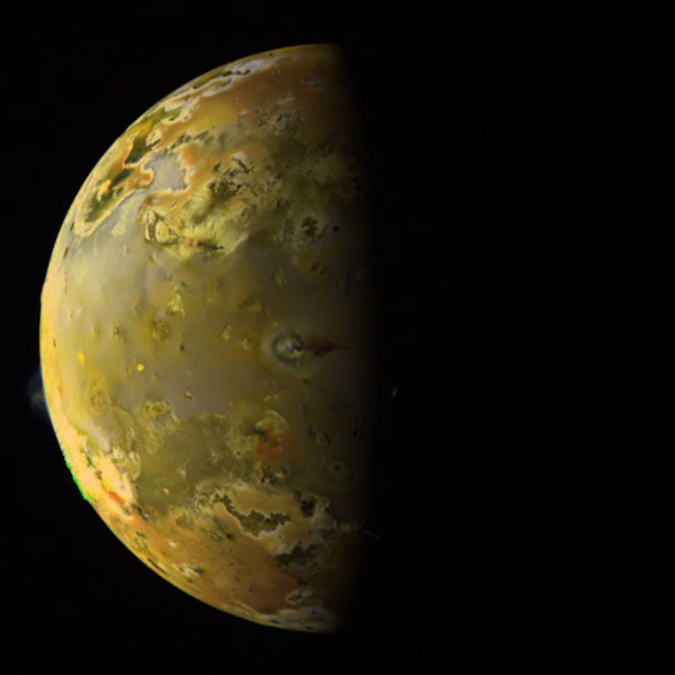 NASA researchers observed a sharp increase in Io's thermal emission at 5 μm on February 20, 1978, possibly due to an interaction between the satellite and Jupiter's magnetosphere, though volcanism was not ruled out. A few days before the Voyager 1 encounter, Stan Peale, Patrick Cassen, and R. T. Reynolds published a paper in the journal Science predicting a volcanically modified surface and a differentiated interior, with distinct rock types rather than a homogeneous blend. They based this prediction on models of Io's interior that took into account the massive amount of heat produced by the varying tidal pull of Jupiter on Io resulting from Io's Laplace resonance with Europa and Ganymede not allowing its orbit to circularize. Their calculations suggested that the amount of heat generated for an Io with a homogeneous interior would be three times greater than the amount of heat generated by radioactive isotope decay alone. This effect would be even greater with a differentiated Io. The first close-up investigation of Io using high-resolution imaging was performed by the twin probes, Voyager 1 and Voyager 2, launched on September 5 and August 20, 1977, respectively. These two spacecraft were part of NASA and JPL's Voyager program to explore the giant outer planets through a series of missions in the late 1970s and 1980s. This was a scaled-down version of the earlier Planetary Grand Tour concept. Both probes contained more sophisticated instrumentation than the previous Pioneer missions, including a camera capable of taking much higher resolution images. This was important for viewing the geologic features of Jupiter's Galilean moons as well as the cloud features of Jupiter itself. They also had spectrometers with a combined spectral range from the far-ultraviolet to the mid-infrared, useful for examining Io's surface and atmospheric composition and to search for thermal emission sources on its surface. Voyager 1 was first of the two probes to encounter the Jupiter system in March 1979. 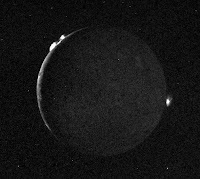 On approach to Jupiter in late February and early March 1979, Voyager imaging scientists noticed that Io appeared distinct from the other Galilean satellites. Its surface was orange in color and marked by dark spots, which were initially interpreted as the sites of impact craters. Among the most intriguing features was a heart-shaped, dark ring 1,000 km (600 mi) across that would later turn out to be the plume deposit of the volcano Pele. The data from the Ultraviolet Spectrometer (UVS) revealed a torus of plasma composed of sulfur ions at the orbit of Io, but tilted to match the equator of Jupiter's magnetic field. The Low-Energy Charged Particle (LECP) detector encountered streams of sodium, sulfur, and oxygen ions prior to entering Jupiter's magnetosphere, material that the LECP science team suspected originated from Io. In the hours prior to Voyager 1's encounter with Io, the spacecraft acquired images for a global map with a resolution of at least 20 km (12 mi) per pixel over the satellite's leading hemisphere (the side that faces the moon's direction of motion around Jupiter) down to less than 1 km (0.6 mi) per pixel over portions of the sub-Jovian hemisphere (the "near" side of Io). The images returned during the approach revealed a strange, multi-colored landscape devoid of impact craters, unlike the other planetary surfaces imaged to that point such as the Moon, Mars, and Mercury. The dark spots in earlier images resembled volcanic calderas more than they did the impact craters seen on those other worlds. Stunned by the oddity of Io's surface, Voyager imaging scientist Laurence Soderblom at a pre-encounter press conference joked, "this one we got all figured out...[Io] is covered with thin candy shells of anything from sulfates and sulfur and salts to all kinds of strange things." On March 5, 1979, Voyager 1 performed the closest encounter with Io of the Voyager mission from a distance of 20,600 km (12,800 mi) over its south pole. The close distance of the encounter allowed Voyager to acquire images of the sub-Jovian and south polar regions of Io with a best resolution of less than 0.5 km (0.3 mi) per pixel. Unfortunately, many of the close-up images were limited by smear as the result of problems with Voyager's internal clock due to the high radiation environment, causing some narrow-angle-camera exposures of Io to be acquired while the Voyager's scan platform was moving between targets. The highest-resolution images showed a relatively young surface punctuated by oddly shaped pits that appeared more akin to volcanic calderas than to impact craters, mountains taller than Mount Everest, and features resembling volcanic lava flows. The majority of the surface was covered in smooth, layered plains, with scarps marking the boundary between different layers. Even in the highest resolution images, no impact craters were observed, suggesting that Io's surface was being regularly renewed by the present-day volcanic activity. The encounter over one of Io's poles allowed Voyager 1 to directly sample the edge of the Io flux tube, finding an intense electrical current of 5 × 106 amperes. The color data from Voyager's cameras showed that Ionian surface was dominated by sulfur and sulfur dioxide (SO2) frosts. Different surface colors were thought to correspond to distinct sulfur allotropes, caused by liquid sulfur being heated to different temperatures, changing its color and viscosity. On March 8, 1979, three days after passing Jupiter, Voyager 1 took images of Jupiter's moons to help mission controllers determine the spacecraft's exact location, a process called optical navigation. While processing images of Io to enhance the visibility of background stars, navigation engineer Linda Morabito found a 300-kilometer (190 mi) tall cloud along the moon's limb. At first, she suspected the cloud to be a moon behind Io, but no suitably sized body would have been in that location. The feature was determined to be a plume generated by active volcanism at a dark depression later named Pele, the feature surrounded by a dark, footprint-shaped ring seen in approach images. Analysis of other Voyager 1 images showed nine such plumes scattered across the surface, proving that Io was volcanically active. The Infrared Interferometer Spectrometer (IRIS) on Voyager 1 discovered thermal emission from multiple sources, indicative of cooling lava. This showed that some of the lava flows visible on the Io's surface were active. IRIS also measured gaseous SO2 within the Loki plume, providing additional evidence for an atmosphere on Io. These results confirmed the prediction made by Peale et al. shortly before the encounter. Voyager 2 passed Io on July 9, 1979 at a distance of 1,130,000 km (702,000 mi), approaching Jupiter between the orbits of Europa and Ganymede. Though it did not approach nearly as close to Io as Voyager 1, comparisons between images taken by the two spacecraft showed several surface changes that had occurred in the four months between the encounters, including new plume deposits at Aten Patera and Surt. The Pele plume deposit had changed shape, from a heart-shape during the Voyager 1 encounter to an oval during the Voyager 2 flyby. Changes in the distribution of diffuse plume deposits and additional dark material were observed in the southern portion of Loki Patera, the consequence of a volcanic eruption there. As a result of the discovery of active volcanic plumes by Voyager 1, a ten-hour "Io Volcano Watch" was added to the departure leg of the Voyager 2 encounter to monitor Io's plumes. Observations of Io's crescent during this monitoring campaign revealed that seven of the nine plumes observed in March were still active in July 1979, with only the volcano Pele shutting down between flybys (no images were available to confirm continued activity at Volund), and no new plumes were observed. The blue color of the plumes observed (Amirani, Maui, Masubi, and Loki) suggested that the reflected light from them came from fine grained particles approximately 1 μm in diameter. Just after the Voyager encounters, the accepted theory was that Io's lava flows were composed of sulfurous compounds. 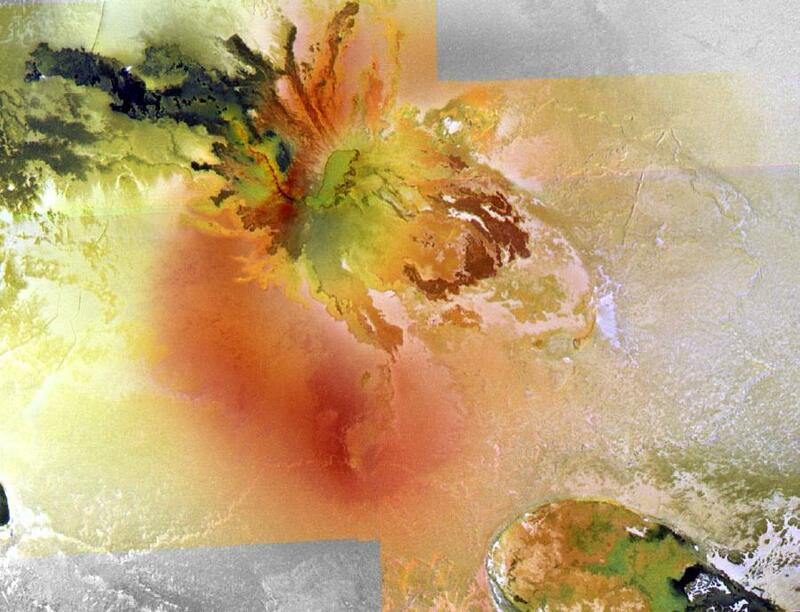 This was based on the color of volcanic terrains, and the low temperatures measured by the IRIS instrument (though IRIS was not sensitive to the high-temperatures associated with active silicate volcanism, where thermal emission peaks in the near-infrared). However, Earth-based infrared studies in the 1980s and 1990s shifted the paradigm from one of primarily sulfur volcanism to one where silicate volcanism dominates, and sulfur acts in a secondary role. In 1986, measurements of a bright eruption on Io's leading hemisphere revealed temperatures higher than the boiling point of sulfur, indicating a silicate composition for at least some of Io's lava flows. Similar temperatures were observed at the Surt eruption in 1979 between the two Voyager encounters, and at the eruption observed by NASA researchers in 1978. In addition, modeling of silicate lava flows on Io suggested that they cooled rapidly, causing their thermal emission to be dominated by lower temperature components, such as solidified flows, as opposed to the small areas covered by still-molten lava near the actual eruption temperature. Spectra from Earth-based observations confirmed the presence of an atmosphere at Io, with significant density variations across Io's surface. These measurements suggested that Io's atmosphere was produced by either the sublimation of sulfur dioxide frost, or from the eruption of gases at volcanic vents, or both. Planning for the next NASA mission to Jupiter began in 1977, just as the two Voyager probes were launched. Rather than performing a flyby of the Jupiter system like all the missions preceding it, the Galileo spacecraft would orbit Jupiter to perform close-up observations of the planet and its many moons, including Io, as well as deliver a Jovian atmospheric probe. Originally scheduled to be launched via the Space Shuttle in 1982, delays resulting from development issues with the shuttle and upper stage motor pushed the launch back, and in 1986 the Challenger disaster delayed Galileo's launch even further. Finally, on October 18, 1989, Galileo began its journey aboard the shuttle Atlantis. En route to Jupiter, the high-gain antenna, folded up like an umbrella to allow the spacecraft to fit in the shuttle cargo bay, failed to open completely. For the rest of the mission, data from the spacecraft would have to be transmitted back to Earth at a much lower data rate using the low-gain antenna. Despite this setback, data compression algorithms uploaded to Galileo allowed it to complete most of its science goals at Jupiter. Galileo arrived at Jupiter on December 7, 1995, after a six-year journey from Earth during which it used gravity assists with Venus and Earth to boost its orbit out to Jupiter. Shortly before Galileo's Jupiter Orbit Insertion maneuver, the spacecraft performed the only targeted flyby of Io of its nominal mission. High-resolution images were originally planned during the encounter, but problems with the spacecraft's tape recorder, used to save data taken during encounters for later playback to Earth, required the elimination of high-data-rate observations from the flyby schedule to ensure the safe recording of Galileo atmospheric probe data. The encounter did yield significant results from lower data rate experiments. Analysis of the Doppler shift of Galileo's radio signal showed that Io is differentiated with a large iron core, similar to that found in the rocky planets of the inner solar system. Magnetometer data from the encounter, combined with the discovery of an iron core, suggested that Io might have a magnetic field. Jupiter's intense radiation belts near the orbit of Io forced Galileo to come no closer than the orbit of Europa until the end of the first extended mission in 1999. Despite the lack of close-up imaging and mechanical problems that greatly restricted the amount of data returned, several significant discoveries at Io were made during Galileo's two-year, primary mission. During the first several orbits, Galileo mapped Io in search of surface changes that occurred since the Voyager encounters 17 years earlier. This included the appearance of a new lava flow, Zamama, and the shifting of the Prometheus plume by 75 km (47 mi) to the west, tracking the end of a new lava flow at Prometheus. Starting with Galileo's first orbit, the spacecraft's camera, the Solid-State Imager (SSI), began taking one or two images per orbit of Io while the moon was in Jupiter's shadow. This allowed Galileo to monitor high-temperature volcanic activity on Io by observing thermal emission sources across its surface. The same eclipse images also allowed Galileo scientists to observe aurorae created by the interaction between Io's atmosphere and volcanic plumes with the Io flux tube and the plasma torus. 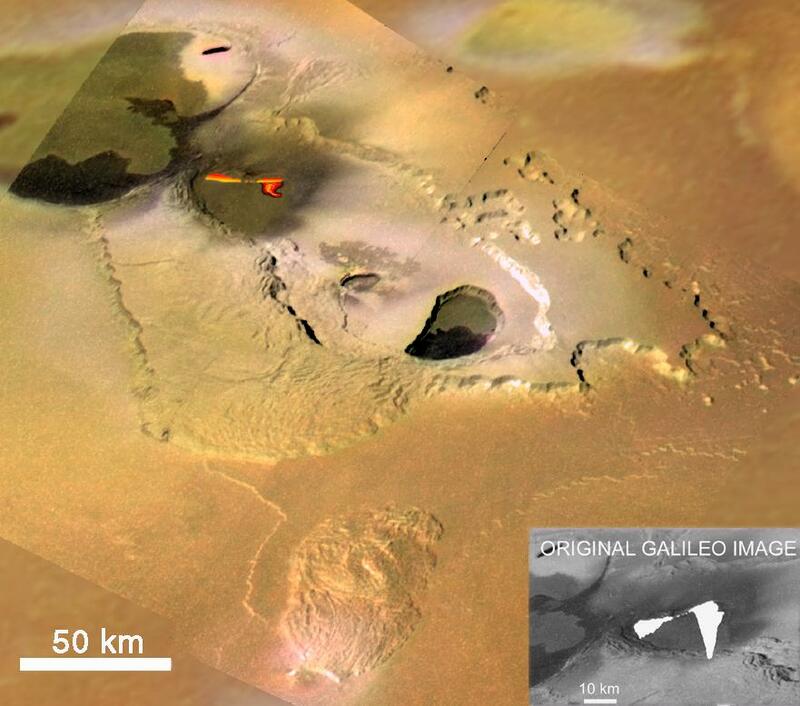 During Galileo's ninth orbit, the spacecraft observed a major eruption at Pillan Patera, detecting high-temperature thermal emission and a new volcanic plume. The temperatures observed at Pillan and other volcanoes confirmed that volcanic eruptions on Io consist of silicate lavas with magnesium-rich mafic and ultramafic compositions, with volatiles like sulfur and sulfur dioxide serving a similar role to water and carbon dioxide on Earth. During the following orbit, Galileo found that Pillan was surrounded by a new, dark pyroclastic deposit composed of silicate minerals such as orthopyroxene. 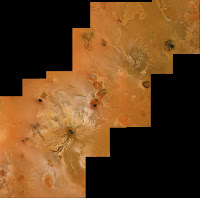 The Near-Infrared Mapping Spectrometer (NIMS) observed Io on a number occasions during the primary mission, mapping its volcanic thermal emission and the distribution of sulfur dioxide frost, the absorption bands of which dominate Io's near-infrared spectrum. J0 December 7, 1995 897 km 557 mi No remote sensing; Gravity measurements reveal differentiated interior, large iron core; magnetic field? In December 1997, NASA approved an extended mission for Galileo known as the Galileo Europa Mission, which ran for two years following the end of the primary mission. The focus of this extended mission was to follow-up on the discoveries made at Europa with seven additional flybys to search for new evidence of a possible sub-surface water ocean. Starting in May 1999, Galileo used four flybys (20 to 23) with Callisto to lower its periapse, setting up a chance for it to fly by Io twice in late 1999. During Galileo's 21st orbit, it acquired a three-color, global mosaic of the anti-Jovian hemisphere (the "far" side of Io), its highest resolution observations of Io to date. This mosaic complemented the coverage obtained by Voyager 1, whose highest resolution observations covered Io's sub-Jovian hemisphere. 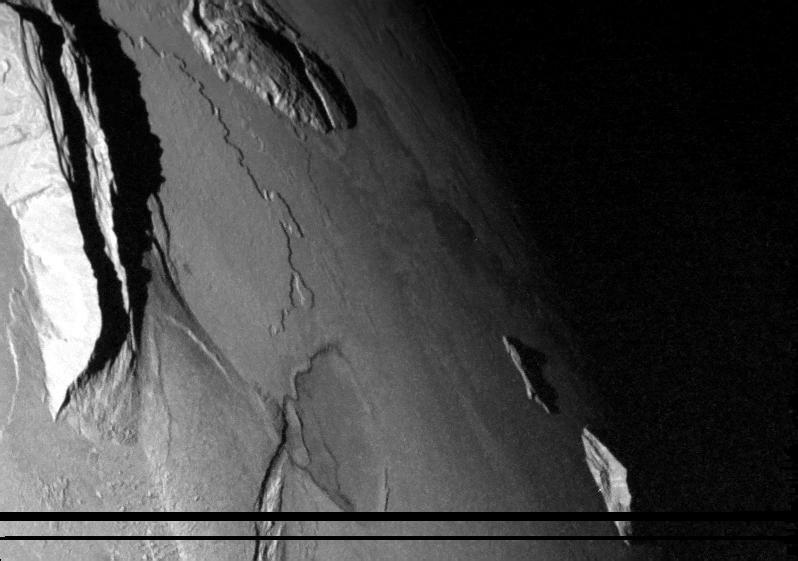 Galileo's two flybys in late 1999, on October 11 and November 26, provided high-resolution images and spectra of various volcanoes and mountains on Io's anti-Jovian hemisphere. The camera suffered a problem with an image mode used extensively during the first encounter, causing the majority of images taken to be highly degraded (though a software algorithm was developed to partially recover some of these images). 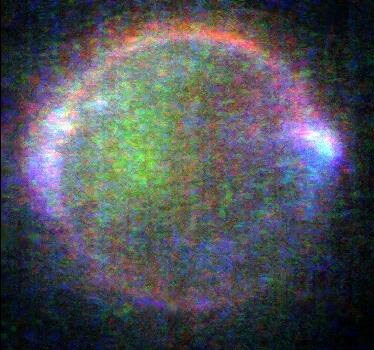 NIMS also had problems due to the high-radiation environment near Io, suffering a hardware failure that limited the number of near-infrared wavelengths it sampled. Finally, the imaging coverage was limited by the low-data rate playback (forcing Galileo to transmit data from each encounter days to weeks later on the apoapse leg of each orbit), and by an incident when radiation forced a reset of the spacecraft's computer putting it into safe mode during the November 1999 encounter. Even so, Galileo fortuitously imaged an outburst eruption at Tvashtar Paterae during the November flyby, observing a curtain of lava fountains 25 km (16 mi) long and 1.5 km (0.93 mi) high. An additional encounter was performed on February 22, 2000. With no new errors with Galileo's remote sensing instruments, no safing events, and more time after the flyby before the next satellite encounter, Galileo was able to acquire and send back more data. This included information on the lava flow rate at Prometheus, Amirani, and Tvashtar, very high resolution imaging of Chaac Patera and layered terrain in Bulicame Regio, and mapping of the mountains and topography around Camaxtli Patera, Zal Patera, and Shamshu Patera. Following the February 2000 encounter, Galileo's mission at Jupiter was extended for a second and final time with the Galileo Millennium Mission. The focus of this extended mission was joint observation of the Jovian system by both Galileo and Cassini, which performed a distant flyby of Jupiter en route to Saturn on December 30, 2000. Discoveries during the joint observations of Io revealed a new plume at Tvashtar and provided insights into Io's aurorae. Distant imaging by Galileo during the Cassini flyby revealed a new red ring plume deposit, similar to the one surrounding Pele, around Tvashtar, one of the first of this type seen in Io's polar regions, though Galileo would later observe a similar deposit around Dazhbog Patera in August 2001. Galileo performed three additional flybys of Io, on August 6 and October 16, 2001 and January 17, 2002, during the Galileo Millennium Mission. 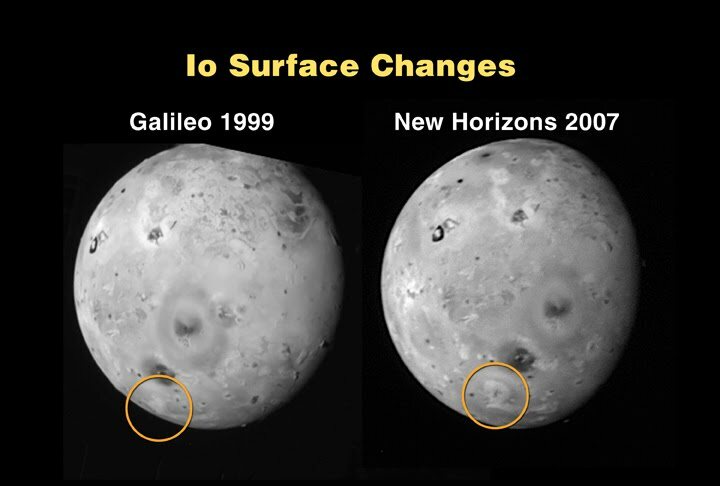 Both encounters in 2001 allowed Galileo to observe Io's polar regions up-close, though imaging from the August 2001 flyby was lost due to a camera malfunction. The data from the magnetometer confirmed that Io lacked an intrinsic magnetic field, though later analysis of this data in 2009 did reveal evidence for an induced magnetic field generated by the interaction between Jupiter's magnetosphere and a silicate magma ocean in Io's asthenosphere. 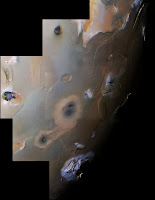 During the August 2001 flyby, Galileo flew through the outer portions of the newly formed Thor volcanic plume, allowing for the first direct measurement of composition of Io's volcanic material. During the October 2001 encounter, Galileo imaged the new Thor eruption site, a major new lava flow at Gish Bar Patera, and the lava lake at Pele. Due to a safing event prior to the encounter, nearly all of the observations planned for the January 2002 flyby were lost. In order to prevent potential biological contamination of the possible Europan biosphere, the Galileo mission ended on September 23, 2003 when the spacecraft was intentionally crashed into Jupiter. Following the end of the Galileo mission, astronomers have continued monitoring Io's active volcanoes with adaptive optics imaging from the Keck telescope in Hawaii and the European Southern Observatory in Chile, as well as imaging from the Hubble telescope. These technologies are used to observe the thermal emissions and measure the composition of gases over volcanoes such as Pele and Tvashtar. Imaging from the Keck telescope in February 2001 revealed the most powerful volcanic eruption observed in modern times, either on Io or on Earth, at the volcano Surt. Earth-based telescopes coming online over the next decade, such as the Thirty Meter Telescope at the Mauna Kea Observatory, will provide more detailed observations of Io's volcanoes, approaching the resolution achieved by Galileo's Near-IR spectrometer. Hubble ultraviolet, millimeter-wave, and ground-based mid-infrared observations of Io's atmosphere have revealed strong density heterogeneities between bright, frost-covered regions along the satellite's equator and its polar regions, providing further evidence that Ionian atmosphere is supported by the sublimation of sulfur dioxide frost on Io's surface. The New Horizons spacecraft, en route to Pluto and the Kuiper belt, flew by the Jupiter system on February 28, 2007, approaching Io to a distance of 2,239,000 km (1,391,000 mi). During the encounter, numerous remote observations of Io were obtained, including visible imaging with a peak resolution of 11.2 km (6.96 mi) per pixel. Like Galileo during its November 1999 flyby of Io and Cassini during encounter in December 2000, New Horizons caught Tvashtar during a major eruption at the same site as the 1999 lava curtain. Owing to Tvashtar's proximity to Io's north pole and its large size, most images of Io from New Horizons showed a large plume over Tvashtar, providing the first detailed observations of the largest class of Ionian volcanic plumes since observations of Pele's plume in 1979. New Horizons also captured images of a volcano near Girru Patera in the early stages of an eruption, and surface changes from several volcanic eruptions that have occurred since Galileo, such as at Shango Patera, Kurdalagon Patera, and Lerna Regio. Two missions for the Jupiter system are currently scheduled, launching in 2011 and 2020. The first, Juno, has limited imaging capabilities, but it could provide monitoring of Io's volcanic activity using its near-infrared spectrometer, the Jupiter InfraRed Auroral Mapper (JIRAM). In 2020 the Europa/Jupiter System Mission (EJSM), a joint NASA/ESA project approved in February 2009, would study Io using NASA's Jupiter Europa Orbiter and ESA's Jupiter Ganymede Orbiter as part of the Jupiter tour segments of both spacecraft before they go into orbit around their respective targets. Since both spacecraft focus primarily on the icy Galilean satellites, most of the observations of Io would be acquired from a distance. However, the Jupiter Europa Orbiter would perform four close flybys of Io in 2025 and 2026 prior to orbiting Europa. 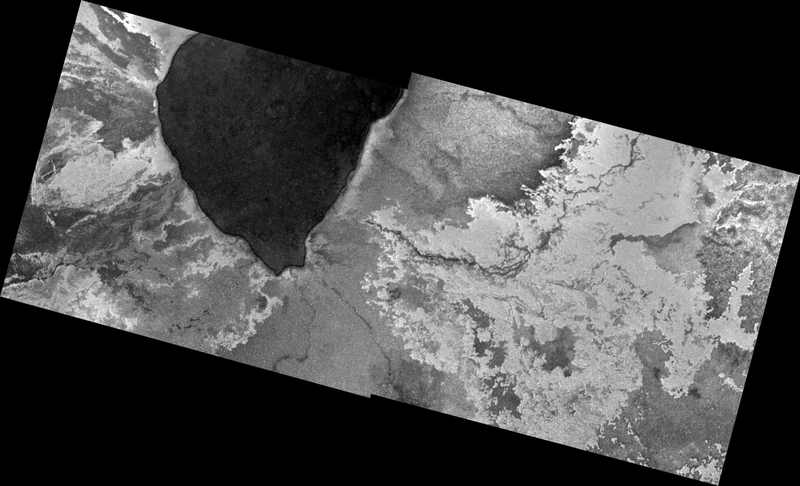 These flybys would not only provide the first close-up imaging of Io's volcanic features in 24 years, but would include studies of Io's topography and subsurface via laser altimetry and ground-penetrating radar and direct measurements of the composition of Io's atmosphere and volcanic plumes via mass spectrometry. With the Jupiter Europa Orbiter's greater downlink bandwidth, substantial greater imaging coverage should be obtained during each flyby than were during Galileo's flybys. The Jupiter Ganymede Orbiter will face funding competition from other ESA projects with final approval in 2011. It will not flyby Io due to its use of solar panels, but will provide distant imaging of Io as well as complementary science with the Jupiter Europa Orbiter. Additional dedicated Io missions have been proposed. One, called the Io Volcano Observer (IVO), would launch in 2015 as a Discovery-class mission and would arrive at Jupiter and Io in July 2021. This mission remains in the concept study phase, but may be submitted as a proposal for the next Discovery Announcement of Opportunity. If selected, IVO would use high-inclination orbits of Jupiter to flyby Io at least six times, perhaps more if an extended mission were approved and the health of the spacecraft holds. The main goals of this proposed mission include measuring Io's volcanic eruption temperatures, determining the composition of Io's lavas, sampling its volcanic plumes through mass spectroscopy, and mapping Io's internal structure using electromagnetic induction sounding. Jupiter's magnetic field lines, which Io crosses, couples Io's atmosphere and neutral cloud to Jupiter's polar upper atmosphere through the generation of an electric current known as the Io flux tube. This current produces an auroral glow in Jupiter's polar regions known as the Io footprint, as well as aurorae in Io's atmosphere. Particles from this auroral interaction act to darken the Jovian polar regions at visible wavelengths. The location of Io and its auroral footprint with respect to the Earth and Jupiter has a strong influence on Jovian radio emissions from our vantage point: when Io is visible, radio signals from Jupiter increase considerably. The Juno mission, planned for the next decade, should help to shed light on these processes. 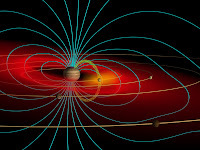 The Jovian magnetic field lines that do get past Io's ionosphere also induce an electric current, which in turn creates an induced magnetic field, within Io's interior. Io's induced magnetic field is thought to be generated within a partially molten, silicate magma ocean 50 kilometers beneath the moon's surface. Similar induced fields were found at the other Galilean satellites by Galileo, generated within liquid water oceans in the interiors of those moons. Io is slightly larger than Earth's Moon. It has a mean radius of 1,821.3 km (1,131.7 mi) (about five percent greater than the Moon's) and a mass of 8.9319 × 1022 kg (about 21 percent greater than the Moon's). It is a slight ellipsoid in shape, with its longest axis directed toward Jupiter. Among the Galilean satellites, in both mass and volume, Io ranks behind Ganymede and Callisto but ahead of Europa. Composed primarily of silicate rock and iron, Io is closer in bulk composition to the terrestrial planets than to other satellites in the outer solar system, which are mostly composed of a mix of water ice and silicates. Io has a density of 3.5275 g/cm3, the highest of any moon in the Solar System; significantly higher than the other Galilean satellites and higher than the Earth's moon. Models based on the Voyager and Galileo measurements of the moon's mass, radius and quadrupole gravitational coefficients (numerical values related to how mass is distributed within an object) suggest that its interior is differentiated between an outer, silicate-rich crust and mantle and an inner, iron- or iron sulfide–rich core. The metallic core makes up approximately 20% of Io's mass. Depending on the amount of sulfur in the core, the core has a radius between 350 and 650 km (220 and 400 mi) if it is composed almost entirely of iron, or between 550 and 900 km (340 and 560 mi) for a core consisting of a mix of iron and sulfur. Galileo's magnetometer failed to detect an internal, intrinsic magnetic field at Io, suggesting that the core is not convecting. 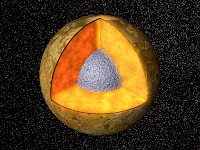 Modeling of Io's interior composition suggests that the mantle is composed of at least 75% of the magnesium-rich mineral forsterite, and has a bulk composition similar to that of L-chondrite and LL-chondrite meteorites, with higher iron content (compared to silicon) than the Moon or Earth, but lower than Mars. To support the heat flow observed on Io, 10–20% of Io's mantle may be molten, though regions where high-temperature volcanism has been observed may have higher melt fractions. However, re-analysis of Galileo magnetometer data in 2009 revealed the presence of an induced magnetic field at Io, requiring a magma ocean 50 km (31 mi) below the surface. It is not known if the 10-20% partial melting percentage for Io's mantle is consistent with the requirement for a significant amount of molten silicates in this possible magma ocean. The lithosphere of Io, composed of basalt and sulfur deposited by Io's extensive volcanism, is at least 12 km (7 mi) thick, but is likely to be less than 40 km (25 mi) thick. 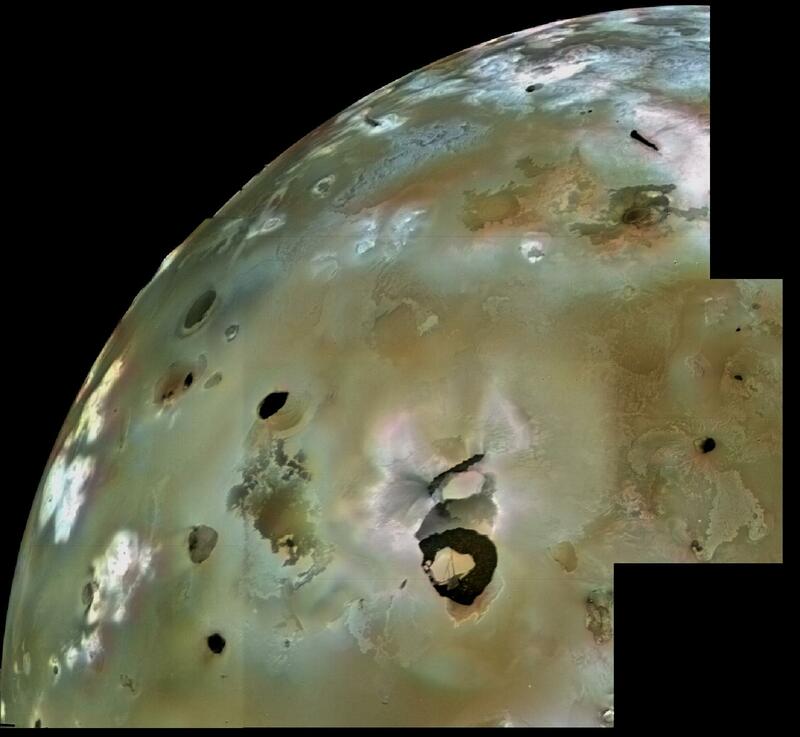 Io's colorful appearance is the result of various materials produced by its extensive volcanism. These materials include silicates (such as orthopyroxene), sulfur, and sulfur dioxide. Sulfur dioxide frost is ubiquitous across the surface of Io, forming large regions covered in white or grey materials. Sulfur is also seen in many places across the satellite, forming yellow to yellow-green regions. Sulfur deposited in the mid-latitude and polar regions is often radiation damaged, breaking up normally stable cyclic 8-chain sulfur. This radiation damage produces Io's red-brown polar regions. Explosive volcanism, often taking the form of umbrella-shaped plumes, paints the surface with sulfurous and silicate materials. Plume deposits on Io are often colored red or white depending on the amount of sulfur and sulfur dioxide in the plume. Generally, plumes formed at volcanic vents from degassing lava contain a greater amount of S2, producing a red "fan" deposit, or in extreme cases, large (often reaching beyond 450 km or 280 mi from the central vent) red rings. 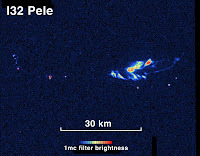 A prominent example of a red-ring plume deposit is located at Pele. These red deposits consist primarily of sulfur (generally 3- and 4-chain molecular sulfur), sulfur dioxide, and perhaps Cl2SO2. Plumes formed at the margins of silicate lava flows (through the interaction of lava and pre-existing deposits of sulfur and sulfur dioxide) produce white or gray deposits. Io has 100 to 150 mountains. These structures average 6 km (4 mi) in height and reach a maximum of 17.5 ± 1.5 km (10.9 ± 0.9 mi) at South Boösaule Montes. Mountains often appear as large (the average mountain is 157 km or 98 mi long), isolated structures with no apparent global tectonic patterns outlined, as is the case on Earth. To support the tremendous topography observed at these mountains requires compositions consisting mostly of silicate rock, as opposed to sulfur. Volcanism on Io, a moon of Jupiter, produces lava flows, volcanic pits, and plumes of sulfur and sulfur dioxide hundreds of kilometres high. This volcanic activity was discovered in 1979 by Voyager 1 imaging scientists. Observations of Io by passing spacecraft (the Voyagers, Galileo, Cassini, and New Horizons) and Earth-based astronomers have revealed more than 150 active volcanoes. Up to 400 such volcanoes are predicted to exist based on these observations. Io's volcanism makes the satellite one of only four known currently volcanically active worlds in the solar system (the other three being Earth, Saturn's moon Enceladus, and Neptune's moon Triton). First predicted shortly before the Voyager 1 flyby, the heat source for Io's volcanism comes from tidal heating produced by its forced orbital eccentricity. This differs from Earth's internal heating, which is derived primarily from radioactive isotope decay. Io's eccentric orbit leads to a slight difference in Jupiter's gravitational pull on the satellite between its closest and farthest points on its orbit, causing a varying tidal bulge. This variation in the shape of Io causes frictional heating in its interior. Without this tidal heating, Io might have been similar to the Earth's moon, a world of similar size and mass, geologically dead and covered with numerous impact craters. Io's volcanism has led to the formation of hundreds of volcanic centres and extensive lava formations, making the moon the most volcanically active body in the Solar System. Three different types of volcanic eruptions have been identified, differing in duration, intensity, lava effusion rate, and whether the eruption occurs within a volcanic pit (known as a patera). Lava flows on Io, tens or hundreds of kilometres long, have primarily basaltic composition, similar to lavas seen on Earth at shield volcanoes such as Kīlauea in Hawaii. While most lavas on Io are made of basalt, a few lava flows consisting of sulfur and sulfur dioxide have been seen. In addition, eruption temperatures as high as 1,600 K (1,300 °C; 2,400 °F) were detected, which can be explained by the eruption of high-temperature ultramafic silicate lavas. As a result of the presence of significant quantities of sulfurous materials in Io's crust and on its surface, some eruptions propel sulfur, sulfur dioxide gas, and pyroclastic material up to 500 kilometres (310 mi) into space, producing large, umbrella-shaped volcanic plumes. This material paints the surrounding terrain in red, black, and/or white, and provides material for Io's patchy atmosphere and Jupiter's extensive magnetosphere. Spacecraft that have flown by Io since 1979 have observed numerous surface changes as a result of Io's volcanic activity. Before the Voyager 1 encounter with Io on March 5, 1979, Io was thought to be a dead world much like the Earth's Moon. The discovery of a cloud of sodium surrounding Io led to theories that the satellite would be covered in evaporites. Hints of discoveries to come arose from Earth-based infrared observations taken in the 1970s. An anomalously high thermal flux, compared to the other Galilean satellites, was discovered during measurements taken at an infrared wavelength of 10 μm while Io was in Jupiter's shadow. At the time, this heat flux was attributed to the surface having a much higher thermal inertia than Europa and Ganymede. 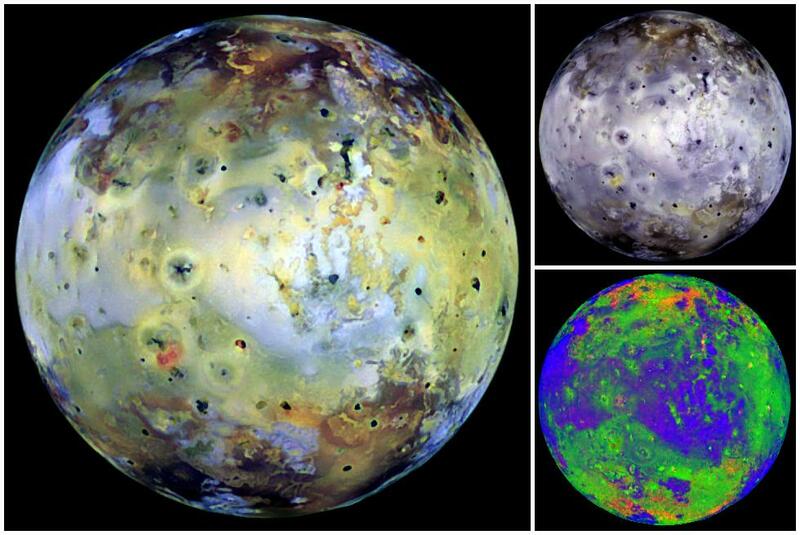 These results were considerably different from measurements taken at wavelengths of 20 μm which suggested that Io had similar surface properties to the other Galilean satellites. It has since been determined that the greater flux at shorter wavelengths was due to the combined flux from Io's volcanoes and solar heating, while solar heating provides a much greater fraction of the flux at longer wavelengths. A sharp increase in Io's thermal emission at 5 μm was observed on February 20, 1978 by Witteborn, et al.. The group considered volcanic activity at the time, in which case the data was fit into a region on Io 8,000 square kilometres (3,100 sq mi) in size at 600 K (300 °C; 600 °F). However, the authors considered that hypothesis unlikely, and instead focused on emission from Io's interaction with Jupiter's magnetosphere. Shortly before the Voyager 1 encounter, Stan Peale, Patrick Cassen, and R. T. Reynolds published a paper in the journal Science predicting a volcanically modified surface and a differentiated interior, with distinct rock types rather than a homogeneous blend. They based this prediction on models of Io's interior that took into account the massive amount of heat produced by the varying tidal pull of Jupiter on Io caused by the moon's slightly eccentric orbit. Their calculations suggested that the amount of heat generated for an Io with a homogeneous interior would be three times greater than the amount of heat generated by radioactive isotope decay alone. This effect would be even greater with a differentiated Io. Voyager 1's first images of Io revealed a lack of impact craters, suggesting a very young surface. Craters are used by geologists to estimate the age of a planetary surface; the number of impact structures increase with the age of the planetary surface. Instead, Voyager 1 observed a multi-coloured surface, pockmarked with irregular-shaped depressions, which lacked the raised rims characteristic of impact craters. Voyager 1 also observed flow features formed by low-viscosity fluid and tall, isolated mountains that did not resemble terrestrial volcanoes. The surface observed suggested that, just as Peale and colleagues had theorized, Io was heavily modified by volcanism. On March 8, 1979, three days after passing Jupiter, Voyager 1 took images of Jupiter's moons to help mission controllers determine the spacecraft's exact location, a process called optical navigation. While processing images of Io to enhance the visibility of background stars, navigation engineer Linda Morabito found a 300-kilometre (190 mi) tall cloud along the moon's limb. 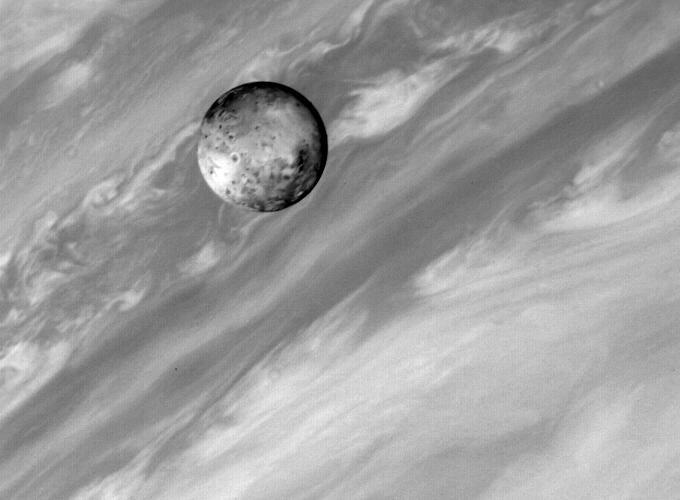 At first, she suspected the cloud to be a moon behind Io, but no suitably sized body would have been in that location. The feature was determined to be a plume generated by active volcanism at a dark depression later named Pele. Following this discovery, seven other plumes were located in earlier Voyager images of Io. Thermal emission from multiple sources, indicative of cooling lava, were also found. Surface changes were observed when images acquired by Voyager 2 were compared to those taken four months previously by Voyager 1, including new plume deposits at Aten Patera and Surt. Io's main source of internal heat comes from the dissipation of tidal forces generated by Jupiter's gravitational pull. This external heating differs from the internal heat source for volcanism on Earth, which is a result of radioactive isotope decay and residual heat from accretion. In the Earth, these internal heat sources drive mantle convection, which in turn causes volcanism through plate tectonics. The tidal heating of Io is dependent on the moon's distance from Jupiter, its orbital eccentricity, the composition of its interior, and its physical state. Its Laplace orbital resonance with Europa and Ganymede maintains Io's eccentricity and prevents tidal dissipation within Io from circularizing its orbit. The eccentricity leads to vertical differences in Io's tidal bulge of as much as 100 metres (330 ft) as Jupiter's gravitational pull varies between the periapsis and apoapsis points in Io's orbit. This varying tidal pull also produces friction in Io's interior, enough to cause significant tidal heating and melting. 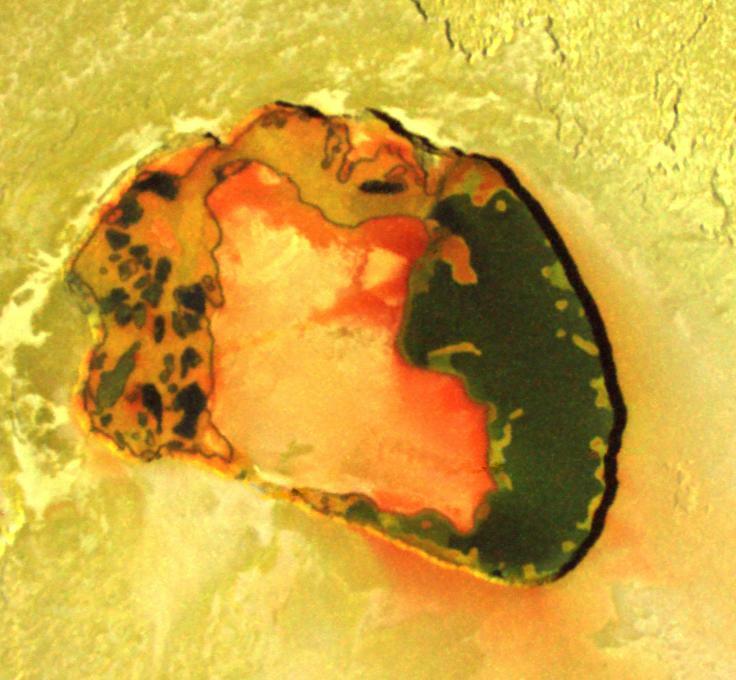 Unlike Earth, where most of its internal heat is released by conduction through the crust, on Io internal heat is released via volcanic activity and generates the satellite's high heat flow (global total: 0.6–1.6 × 1014 W). Models of its orbit suggest that the amount of tidal heating within Io changes with time, and that the current heat flow is not representative of the long-term average. The observed release of heat from Io's interior is greater than estimates for the amount presently generated from tidal heating, suggesting that Io is cooling after a period of greater flexing. Analysis of Voyager images led scientists to believe that the lava flows on Io were composed mostly of various forms of molten elemental sulfur. The colouration of the flows was found to be similar to its various allotropes. Differences in the lava colour and brightness are a function of the temperature of polyatomic sulfur and the packing and bonding of its atoms. An analysis of the flows that radiate out from Ra Patera revealed differently colored materials, all associated with liquid sulfur, at different distances from the vent: dark albedo material close to the vent at 525 K (252 °C; 485 °F), red material in the central part of each flow at 450 K (177 °C; 350 °F), and orange material at the farthest ends of each flow at 425 K (152 °C; 305 °F). This colour pattern corresponds to flows radiating out from a central vent, cooling as the lava travels away from it. In addition, temperature measurements of thermal emission at Loki Patera taken by Voyager 1's Infrared Interferometer Spectrometer and Radiometer (IRIS) instrument were consistent with sulfur volcanism. However, the IRIS instrument was not capable of detecting wavelengths that are indicative of higher temperatures. This meant that temperatures consistent with silicate volcanism were not discovered by Voyager. Despite this, Voyager scientists deduced that silicates must play a role in Io's youthful appearance, from the moon's high density and the need for silicates to support the steep slopes along patera walls. The contradiction between the structural evidence and the spectral and temperature data following the Voyager flybys led to a debate in the planetary science community regarding the composition of Io's lava flows, whether they were composed of silicate or sulfurous materials. Earth-based infrared studies in the 1980s and 1990s shifted the paradigm from one of primarily sulfur volcanism to one where silicate volcanism dominates, and sulfur acts in a secondary role. In 1986, measurements of a bright eruption on Io's leading hemisphere revealed temperatures of at least 900 K (600 °C; 1,200 °F). This is higher than the boiling point of sulfur (715 K/442 °C; 827 °F), indicating a silicate composition for at least some of Io's lava flows. Similar temperatures were also observed at the Surt eruption in 1979 between the two Voyager encounters, and at the eruption observed by Witteborn and colleagues in 1978. In addition, modeling of silicate lava flows on Io suggested that they cooled rapidly, causing their thermal emission to be dominated by lower temperature components, such as solidified flows, as opposed to the small areas covered by still molten lava near the actual eruption temperature. Silicate volcanism, involving basaltic lava with mafic to ultramafic (magnesium-rich) compositions, was confirmed by the Galileo spacecraft in the 1990s and 2000s from temperature measurements of Io's numerous hot spots, locations where thermal emission is detected, and from spectral measurements of Io's dark material. Temperature measurements from Galileo's Solid-State Imager (SSI) and Near-Infrared Mapping Spectrometer (NIMS) revealed numerous hot spots with high-temperature components ranging from at least 1,200 K (900 °C; 1,700 °F) to a maximum of 1,600 K (1,300 °C; 2,400 °F), like at the Pillan Patera eruption in 1997. Initial estimates during the course of the Galileo mission suggesting eruption temperatures approaching 2,000 K (1,700 °C; 3,100 °F) have since proven to be overestimates since the wrong thermal models were used to calculate the temperatures. Spectral observations of Io's dark material suggested the presence of orthopyroxenes, such as enstatite, magnesium-rich silicate minerals common in mafic and ultramafic basalt. This dark material is seen in volcanic pits, fresh lava flows, and pyroclastic deposits surrounding recent, explosive volcanic eruptions. Based on the measured temperature of the lava and the spectral measurements, some of the lava may be analogous to terrestrial komatiites. Compressional superheating, which could increase the temperature of magma during ascent to the surface during an eruption, may also be a factor in some of the higher temperature eruptions. While temperature measurements of Io's volcanoes settled the sulfur-versus-silicates debate that persisted between the Voyager and Galileo missions at Jupiter, sulfur and sulfur dioxide still play a significant role in the phenomena observed on Io. Both materials have been detected in the plumes generated at Io's volcanoes, with sulfur being a primary constituent of Pele-type plumes. 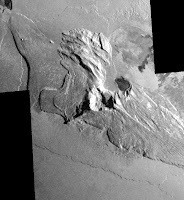 Bright flows have been identified on Io, at Tsũi Goab Fluctus, Emakong Patera, and Balder Patera for example, that are suggestive of effusive sulfur or sulfur dioxide volcanism. Observations of Io by spacecraft and Earth-based astronomers have led to the identification of differences in the types of eruptions seen on the satellite. The three main types identified include intra-patera, flow-dominated, and explosion-dominated eruptions. They differ in terms of duration, energy released, brightness temperature (determined from infrared imaging), type of lava flow, and whether it is confined within volcanic pits. Intra-patera eruptions occur within volcanic depressions known as paterae, which generally have flat floors bounded by steep walls. Paterae resemble terrestrial calderas, but it is unknown whether they form when an empty lava chamber collapses, like their terrestrial cousins. One hypothesis suggests that they are produced through the exhumation of volcanic sills, with the overlying material either being blasted out or integrated into the sill. Some paterae display evidence for multiple collapses, similar to the calderas atop Olympus Mons on Mars or Kīlauea on Earth, suggesting that they may occasionally form like volcanic calderas. Since the formation mechanism is still uncertain, the general term for these features uses the Latin descriptor term employed by the International Astronomical Union in naming them, paterae. Unlike similar features on Earth and Mars, these depressions generally do not lie at the peak of shield volcanoes and are larger, with an average diameter of 41 kilometres (25 mi) and depth of 1.5 kilometres (0.9 mi). The largest volcanic depression on Io is Loki Patera at 202 kilometres (126 mi) across. Whatever the formation mechanism, the morphology and distribution of many paterae suggest that they are structurally controlled, with at least half bounded by faults or mountains. This eruption style can take the form of either lava flows, spreading across the floor of the paterae, or lava lakes. Except for observations by Galileo during its seven close flybys, it can be difficult to tell the difference between a lava lake and a lava flow eruption on a patera floor, due to inadequate resolution and similar thermal emission characteristics. Intra-patera lava flow eruptions, such as the Gish Bar Patera eruption in 2001, can be just as voluminous as those seen spreading out across the Ionian plains. Flow-like features have also been observed within a number of paterae, like Camaxtli Patera, suggesting that lava flows periodically resurface their floors. Ionian lava lakes are depressions partially filled with molten lava covered by a thin solidified crust. These lava lakes are directly connected to a magma reservoir lying below. Observations of thermal emission at several Ionian lava lakes reveal glowing molten rock along the patera margin, caused by the lake's crust breaking up along the edge of the patera. Over time, because the solidified lava is denser than the still-molten magma below, this crust can founder, triggering an increase in thermal emission at the volcano. For some lava lakes, like the one at Pele, this occurs continuously, making Pele one of the brightest emitters of heat in the near-infrared spectrum on Io. At other sites, such as at Loki Patera, this can occur episodically. During an overturning episode at these more quiescent lava lakes, a wave of foundering crust spreads out across the patera at the rate of about 1 kilometre (0.6 mi) per day, with new crust forming behind it until the entire lake has been resurfaced. Another eruption would only begin once the new crust has cooled and thickened enough for it to no longer be buoyant over the molten lava. During an overturning episode, Loki can emit up to ten times more heat than when its crust is stable. Flow-dominated eruptions are long-lived events that build up extensive, compound lava flows. The extent of these flows makes them a major terrain type on Io. In this style of eruption, magma emerges onto the surface from vents on the floor of paterae, vents surrounding paterae, or from fissures on the plains, producing inflated, compound lava flows similar to those seen at Kīlauea in Hawaii. Images from the Galileo spacecraft revealed that many of Io's major flows, like those at Prometheus and Amirani, are produced by the build-up of small breakouts of lava on top of older flows. Flow-dominated eruptions differ from explosion-dominated eruptions by their longevity and their lower energy output per unit of time. Lava erupts at a generally steady rate, and flow-dominated eruptions can last for years or decades. Active flow fields more than 300 kilometres (190 mi) long have been observed on Io at Amirani and Masubi. A relatively inactive flow field named Lei-Kung Fluctus covers more than 125,000 square kilometres (48,000 sq mi), an area slightly larger than Nicaragua. The thickness of flow fields was not determined by Galileo, but the individual breakouts on their surface are likely to be 1 metre (3 ft 3 in) thick. In many cases, active lava breakouts flow out onto the surface at locations tens to hundreds of kilometres from the source vent, with low amounts of thermal emission observed between it and the breakout. This suggests that lava flows through lava tubes from the source vent to the breakout. While these eruptions generally have a steady eruption rate, larger outbreaks of lava have been observed at many flow-dominated eruption sites. For example, the leading edge of the Prometheus flow field moved 75 to 95 kilometres (47 to 59 mi) between observations by Voyager in 1979 and Galileo in 1996. While generally dwarfed by explosion-dominated eruptions, average flow rate at these compound flow fields is much greater than what is observed at similar contemporary lava flows on Earth. Average surface coverage rates of 35–60 square metres (380–650 sq ft) per second were observed at Prometheus and Amirani during the Galileo mission, compared to 0.6 square metres (6.5 sq ft) per second at Kīlauea. Explosion-dominated eruptions are the most pronounced of Io's eruption styles. These eruptions, sometimes called "outburst" eruptions from their Earth-based detections, are characterized by their short duration (lasting only weeks or months), rapid onset, large volumetric flow rates, and high thermal emission. They lead to a short-lived, significant increase in Io's overall brightness in the near-infrared. The most powerful volcanic eruption observed in historical times was an "outburst" eruption at Surt, observed by Earth-based astronomers on February 22, 2001. Explosion-dominated eruptions occur when a body of magma (called a dike) from deep within Io's partially molten mantle reaches the surface at a fissure. This results in a spectacular display of lava fountains. During the beginning of the outburst eruption, thermal emission is dominated by strong, 1–3 μm infrared radiation. It is produced by a large amount of exposed, fresh lava within the fountains at the eruption source vent. 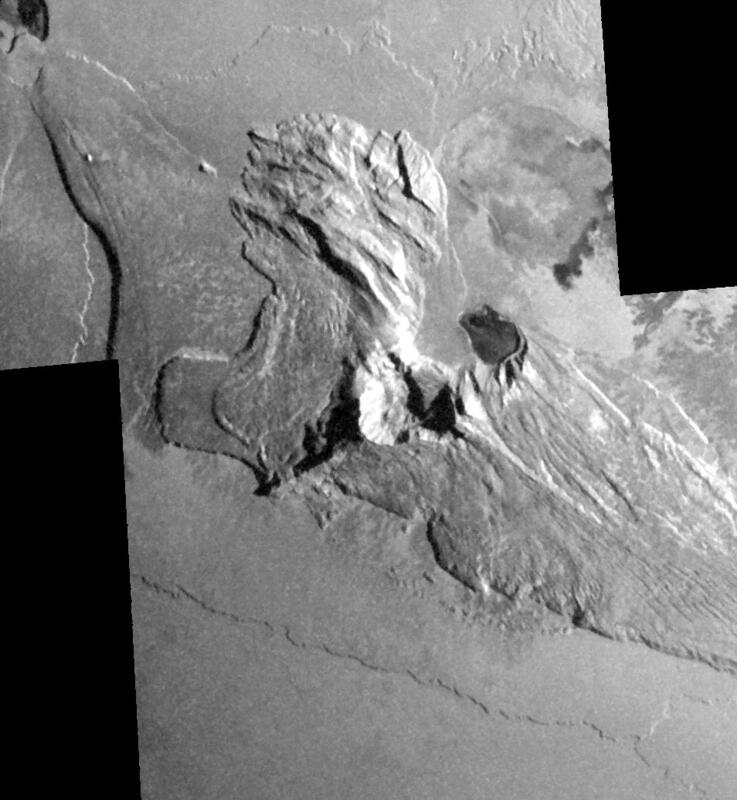 Outburst eruptions at Tvashtar in November 1999 and February 2007 centred around a 25-kilometre (16 mi) long, 1-kilometre (0.62 mi) tall lava "curtain" produced at a small patera nested within the larger Tvashtar Paterae complex. The large amount of exposed molten lava at these lava fountains has provided researchers with their best opportunity to measure the actual temperatures of Ionian lavas. Temperatures suggestive of an ultramafic lava composition similar to Pre-Cambrian komatiites (about 1,600 K / 1,300 °C; 2,400 °F) are dominant at such eruptions, though superheating of the magma during ascent to the surface cannot be ruled out as a factor in the high eruption temperatures. While the more explosive, lava-fountaining stage may last only a few days to a week, explosion-dominated eruptions can continue for weeks to months, producing large, voluminous silicate lava flows. A major eruption in 1997 from a fissure north-west of Pillan Patera produced more than 31 cubic kilometres (7.4 cu mi) of fresh lava over a two and a half to five and a half month period, and later flooded the floor of Pillan Patera. Observations by Galileo suggest lava coverage rates at Pillan between 1,000 and 3,000 square metres (11,000 and 32,000 sq ft) per second during the 1997 eruption. The Pillan flow was found to be 10 metres (33 ft) thick, compared to the 1-metre (3 ft 3 in) thick flows observed at the inflated fields at Prometheus and Amirani. Similar, rapidly emplaced lava flows were observed by Galileo at Thor in 2001. Such flow rates are similar to those seen at Iceland's Laki eruption in 1783 and in terrestrial flood basalt eruptions. Explosion-dominated eruptions can produce dramatic (but often short-lived) surface changes around the eruption site, such as large pyroclastic and plume deposits produced as gas exsolves from lava fountains. The 1997 Pillan eruption produced a 400-kilometre (250 mi) wide deposit of dark, silicate material and bright sulfur dioxide. The Tvashtar eruptions of 2000 and 2007 generated a 330-kilometre (210 mi) tall plume that deposited a ring of red sulfur and sulfur dioxide 1,200 kilometres (750 mi) wide. Despite the dramatic appearance of these features, without continuous resupply of material, the vent surroundings often revert back to their pre-eruption appearance over a period of months (in the case of Grian Patera) or years (as at Pillan Patera). The discovery of volcanic plumes at Pele and Loki in 1979 provided conclusive evidence that Io was geologically active. Generally, plumes form when volatiles like sulfur and sulfur dioxide are ejected skyward from Io's volcanoes at speeds reaching 1 kilometre per second (0.62 mi/s), creating umbrella-shaped clouds of gas and dust. Additional materials that might be found in the volcanic plumes include sodium, potassium, and chlorine. While striking in appearance, volcanic plumes are relatively uncommon. Of the 150 or so active volcanoes observed on Io, plumes have only been observed at a couple of dozen of them. The limited area of Io's lava flows suggests that much of the resurfacing needed to erase Io's cratering record must come from plume deposits. The most common type of volcanic plume on Io are dust plumes, or Prometheus-type plumes, produced when encroaching lava flows vaporize underlying sulfur dioxide frost, sending the material skyward. Examples of Prometheus-type plumes include Prometheus, Amirani, Zamama, and Masubi. These plumes are usually less than 100 kilometres (62 mi) tall with eruption velocities around 0.5 kilometres per second (0.31 mi/s). Prometheus-type plumes are dust-rich, with a dense inner core and upper canopy shock zone, giving them an umbrella-like appearance. These plumes often form bright circular deposits, with a radius ranging between 100 and 250 kilometres (62 and 160 mi) and consisting primarily of sulfur dioxide frost. Prometheus-type plumes are frequently seen at flow-dominated eruptions, helping make this plume type quite long-lived. Four out of the six Prometheus-type plumes observed by Voyager 1 in 1979 were also observed throughout the Galileo mission and by New Horizons in 2007. While the dust plume can be clearly seen in sunlit visible-light images of Io acquired by passing spacecraft, many Prometheus-type plumes have an outer halo of fainter, more gas-rich material reaching heights approaching that of the larger, Pele-type plumes. Io's largest plumes, Pele-type plumes, are created when sulfur and sulfur dioxide gas exsolve from erupting magma at volcanic vents or lava lakes, carrying silicate pyroclastic material with them. 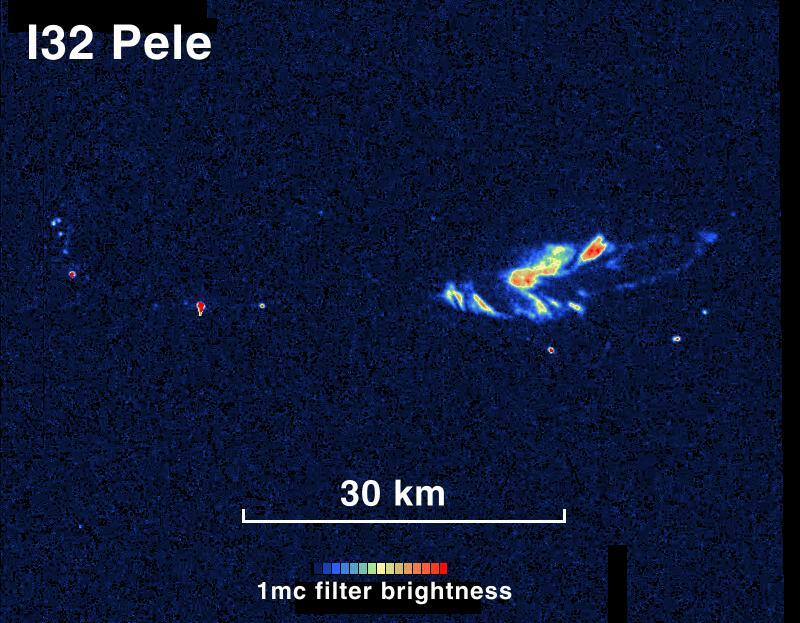 The few Pele-type plumes that have been observed are usually associated with explosion-dominated eruptions, and are short-lived. The exception to this is Pele, which is associated with a long-lived active lava lake eruption, though the plume is thought to be intermittent. The higher vent temperatures and pressures associated with these plumes generate eruption speeds of up to 1 kilometre per second (0.62 mi/s), allowing them to reach heights of between 300 and 500 kilometres (190 and 310 mi). Pele-type plumes form red (from short-chain sulfur) and black (from silicate pyroclastics) surface deposits, including large 1,000 kilometres (620 mi)-wide red rings, as seen at Pele. They are generally fainter than Prometheus-type plumes as a result of the low dust content, causing some to be called stealth plumes. These plumes are sometimes only seen in images acquired while Io is in the shadow of Jupiter or those taken in the ultraviolet range. The little dust that is visible in sunlit images is generated when sulfur and sulfur dioxide condense as the gases reach the top of their ballistic trajectories. That is why these plumes lack the dense central column seen in Prometheus-type plumes, in which dust is generated at the plume source. Examples of Pele-type plumes have been observed at Pele, Tvashtar, and Grian. Io has an extremely thin atmosphere consisting mainly of sulfur dioxide (SO2), with minor constituents including sulfur monoxide (SO), sodium chloride (NaCl), and atomic sulfur and oxygen. The atmosphere has significant variations in density and temperature with time of day, latitude, volcanic activity, and surface frost abundance. The maximum atmospheric pressure on Io ranges from 0.33 × 10-4 to 3 × 10-4 Pascals (Pa) or 0.3 to 3 nbar, spatially seen on Io's anti-Jupiter hemisphere and along the equator, and temporally in the early afternoon when the temperature of surface frost peaks. Localized peaks at volcanic plumes have also been seen, with pressures of 5 × 10-4 to 40 × 10-4 Pa (5 to 40 nbar). Io's atmospheric pressure is lowest on the moon's night-side, where the pressure dips to 0.1 × 10-7 to 1 × 10-7 Pa (0.0001 to 0.001 nbar). Io's atmospheric temperature ranges from the temperature of the surface at low altitudes, where sulfur dioxide is in vapor pressure equilibrium with frost on the surface, to 1800 K at higher altitudes where the thinner atmospheric density permits heating from plasma in the Io plasma torus and from Joule heating from the Io flux tube. The low pressure limits the atmosphere's effect on the surface, except for temporarily redistributing sulfur dioxide from frost-rich to frost-poor areas, and to expand the size of plume deposit rings when plume material re-enters the thicker dayside atmosphere. The thin Ionian atmosphere also means any future landing probes sent to investigate Io will not need to be encased in an aeroshell-style heatshield, but instead will require retrorockets for a soft landing. The thin atmosphere also necessitates a rugged lander capable of enduring the strong Jovian radiation, which a thicker atmosphere would attenuate. Gas in Io's atmosphere is stripped by Jupiter's magnetosphere, escaping to either the neutral cloud that surrounds Io, or the Io plasma torus, a ring of ionized particles that shares Io's orbit but co-rotates with the magnetosphere of Jupiter. Approximately one ton of material is removed from the atmosphere every second through this process so that it must be constantly replenished. The most dramatic source of SO2 are volcanic plumes, which pump 104 kg of sulfur dioxide per second into Io's atmosphere on average, though most of this condenses back onto the surface. Much of the sulfur dioxide in Io's atmosphere sustained by sunlight-driven sublimation of SO2 frozen on the surface. The day-side atmosphere is largely confined to within 40° of the equator, where the surface is warmest and most active volcanic plumes reside. A sublimation-driven atmosphere is also consistent with observations that Io's atmosphere is densest over the anti-Jupiter hemisphere, where SO2 frost is most abundant, and is densest when Io is closer to the sun. However, some contribution from volcanic plume are required as the highest observed densities have been seen near volcanic vents. Because the density of sulfur dioxide in the atmosphere is tied directly to surface temperature, Io's atmosphere partially collapses at night or when the satellite is in the shadow of Jupiter. The collapse during eclipse is limited somewhat by the formation of a diffusion layer of sulfur monoxide in the lowest portion of the atmosphere, but the atmosphere pressure of Io's nightside atmosphere is two to four orders of magnitude less than at its peak just past noon. The minor constituents of Io's atmosphere, such as NaCl, SO, S, and S derive either from: direct volcanic outgassing; photodissociation, or chemical breakdown caused by solar ultraviolet radiation, from SO2; or the sputtering of surface deposits by charged particles from Jupiter's magnetosphere. High-resolution images of Io acquired while the satellite is experiencing an eclipse reveal an aurora-like glow. As on Earth, this is due to radiation hitting the atmosphere, though in this case the charged particles come from Jupiter's magnetic field rather than the solar wind. Aurorae usually occur near the magnetic poles of planets, but Io's are brightest near its equator. Io lacks an intrinsic magnetic field of its own; therefore, electrons traveling along Jupiter's magnetic field near Io directly impact the satellite's atmosphere. More electrons collide with the atmosphere, producing the brightest aurora, where the field lines are tangent to the satellite (i.e., near the equator), since the column of gas they pass through is longer there. Aurorae associated with these tangent points on Io are observed to rock with the changing orientation of Jupiter's tilted magnetic dipole. Fainter aurora from oxygen atoms along the limb of Io (the red glows in the image at right), and sodium atoms on Io's night-side (the green glows in the same image) have also been observed.